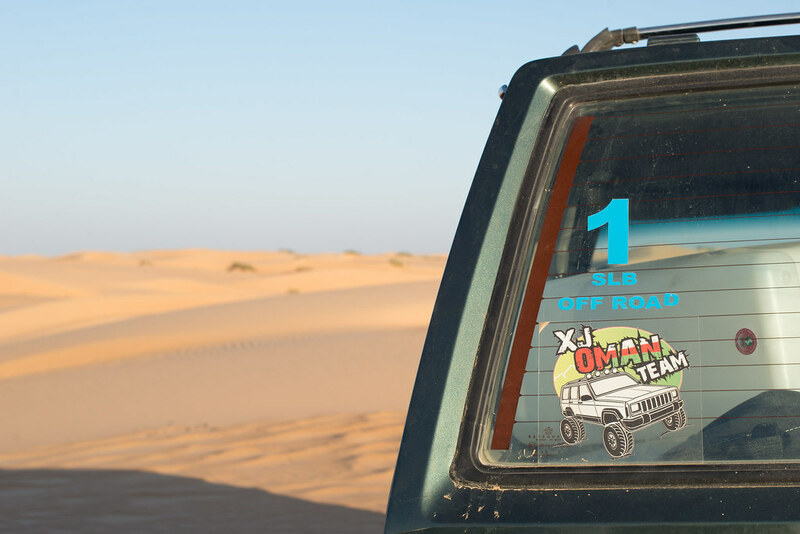 Oman is the second, and last country that was part of our impromptu detour between Azerbaijan and India. We knew very little about the country prior to arriving, we were not sure what to expect apart from warm weather and sunny skies. 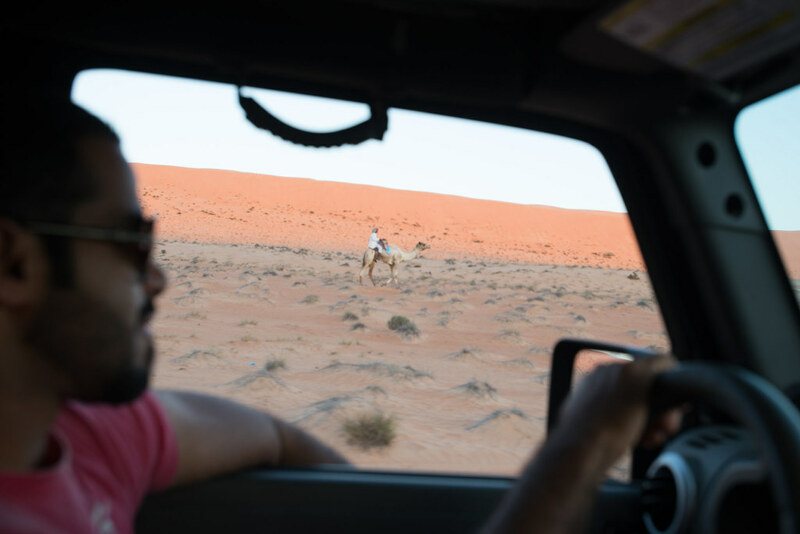 What we found was a country filled with beauty, amazing landscapes unlike anything we have come across on the trip and some of the friendliest people we have met so far. 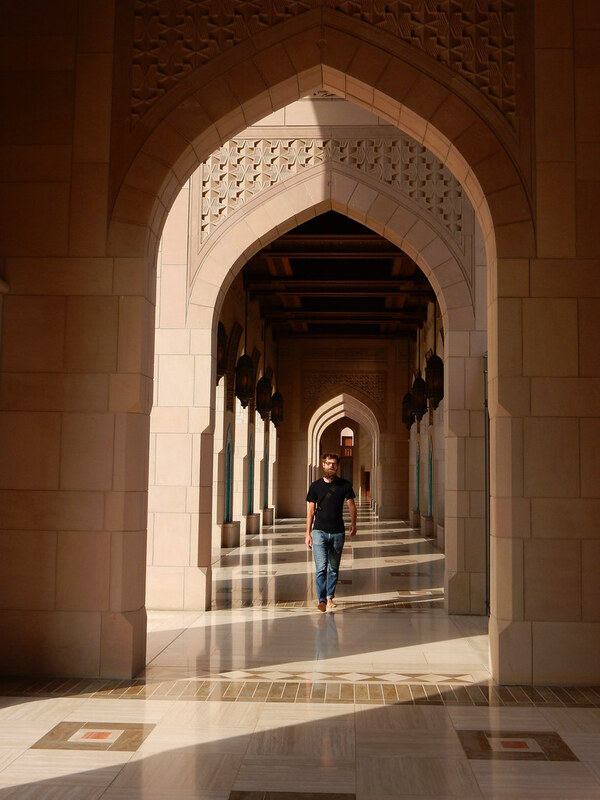 Oman is located in the Middle East and borders the UAE, Saudi Arabia, and Yemen with a very large coast on the Arabian sea. 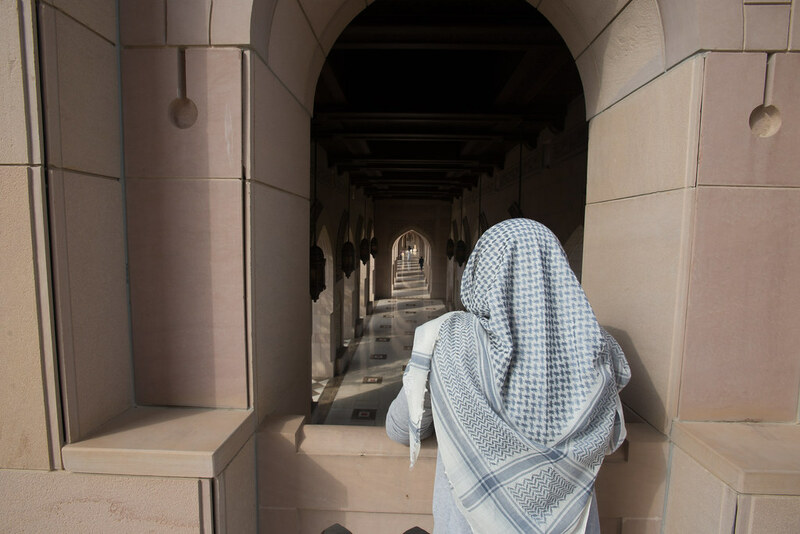 Like all the countries in the region Arabic is the primary language spoken, however we found that nearly every person (young and old) we met spoke fairly good if not fluent english. 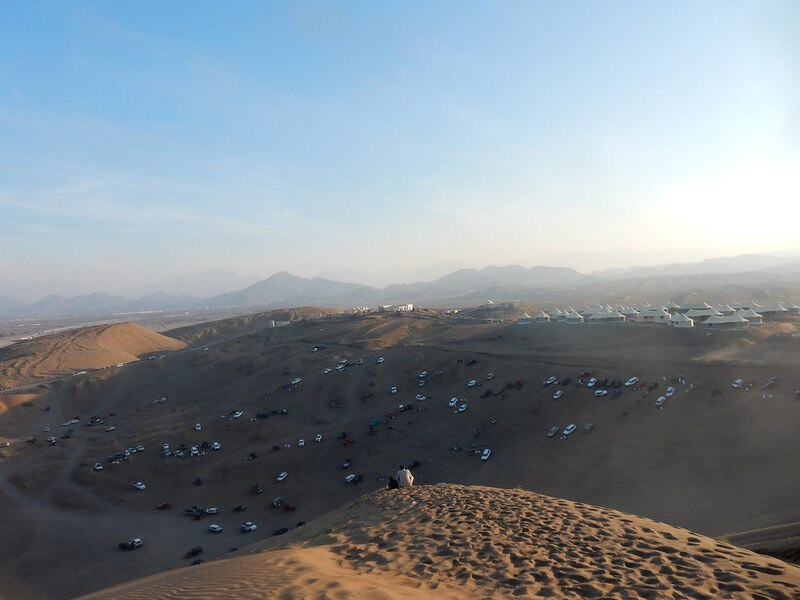 We crossed into Oman on Christmas day from the UAE through Hatta via Hwy. 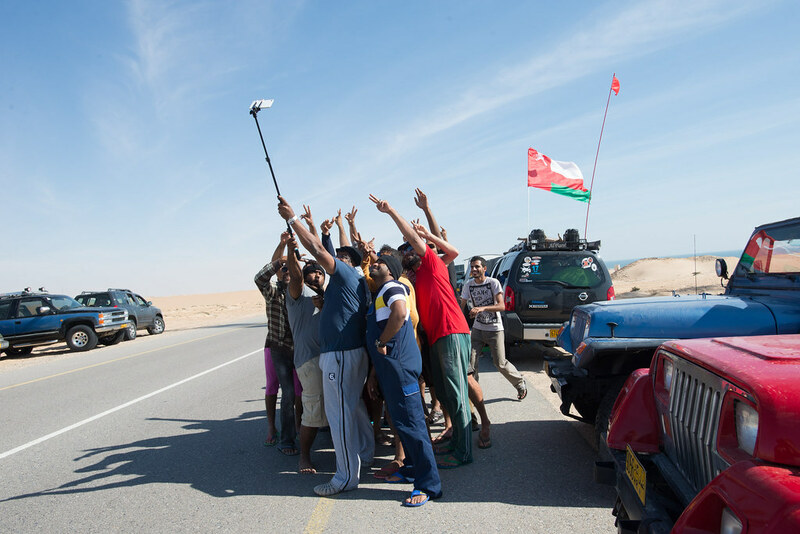 5 (Oman) & 44 (UAE) Obtaining a visa was an easy process, which involved filling out a form at the border. On the day we crossed the border, there was a rush on, we happened to be next to an American and a couple from Lebanon, so we had some people to chat with while we all waited. After a few hours of waiting in a slow moving queue, we were fortunate enough to have the visa fee waived by the border agent when he learned we were on bicycles. 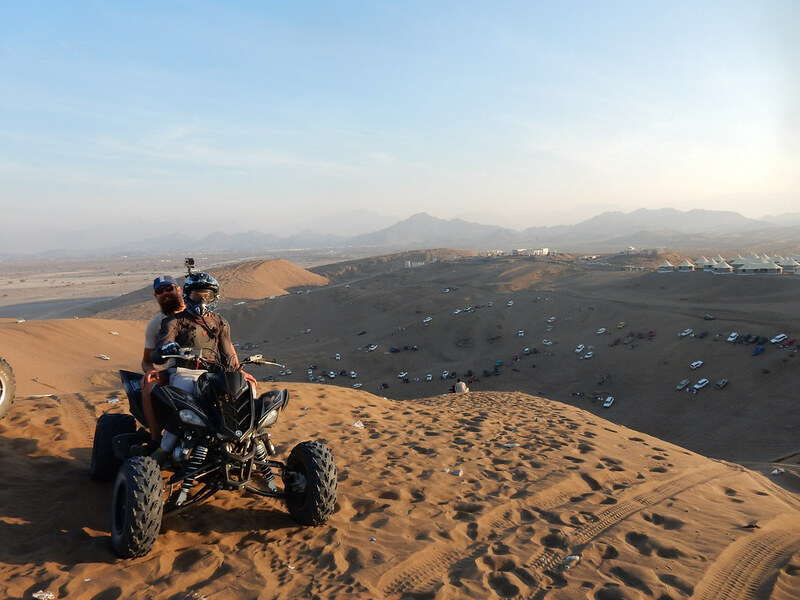 The normal fee is 20 Omani Rials (£35) for 11-30 days, incase you are interested! 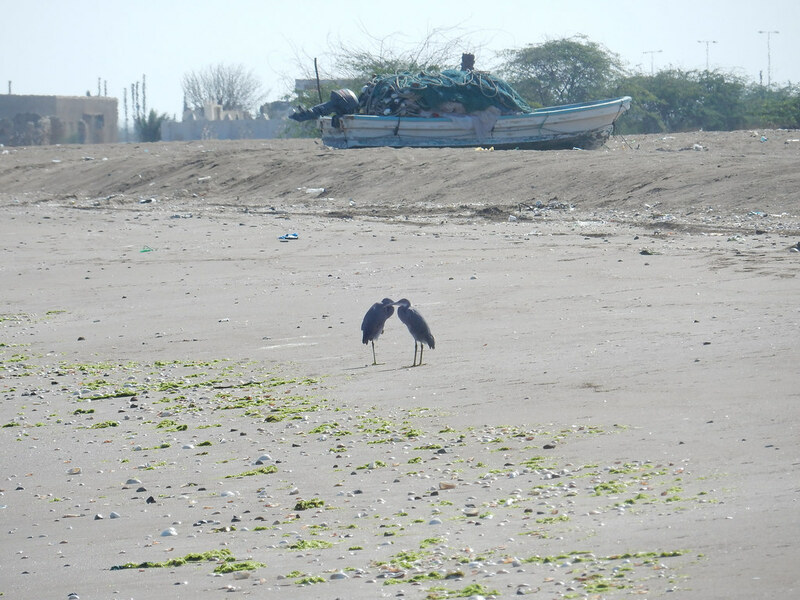 We chose to come to Oman in part because of the weather. Their “winter” is similar to a Canadian summer. 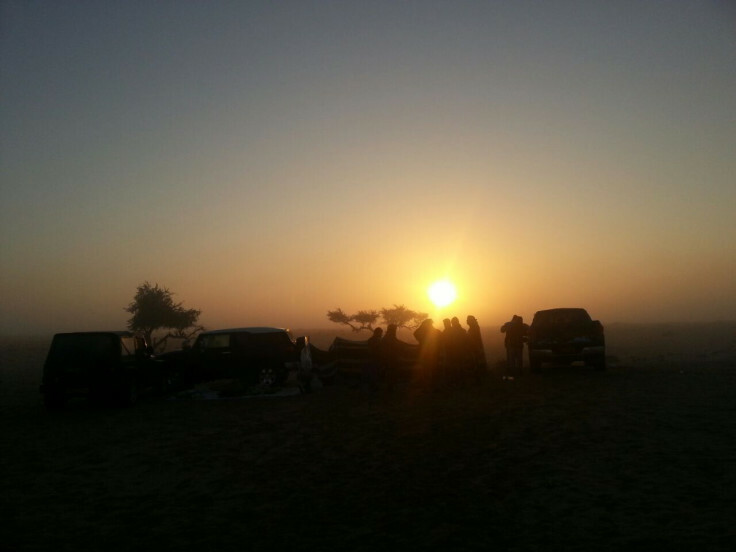 We had temperatures between 20º-35ºC and even in the evenings temperatures stayed in the 20’s especially at lower elevations. It was a very welcome change from the icy weather we had recently left in Azerbaijan. It was our second night camping in the Gulf. 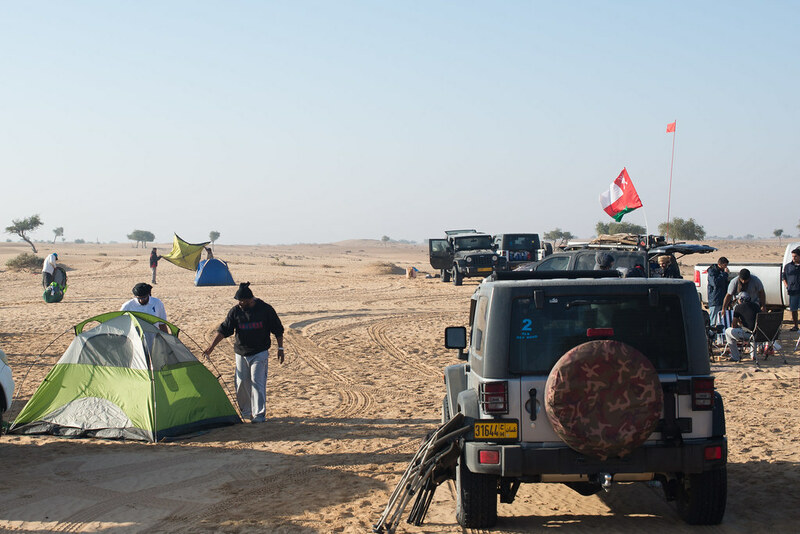 We had read that camping is no problem anywhere, and that often you will find yourself with a neighbour as soon as you set up camp. 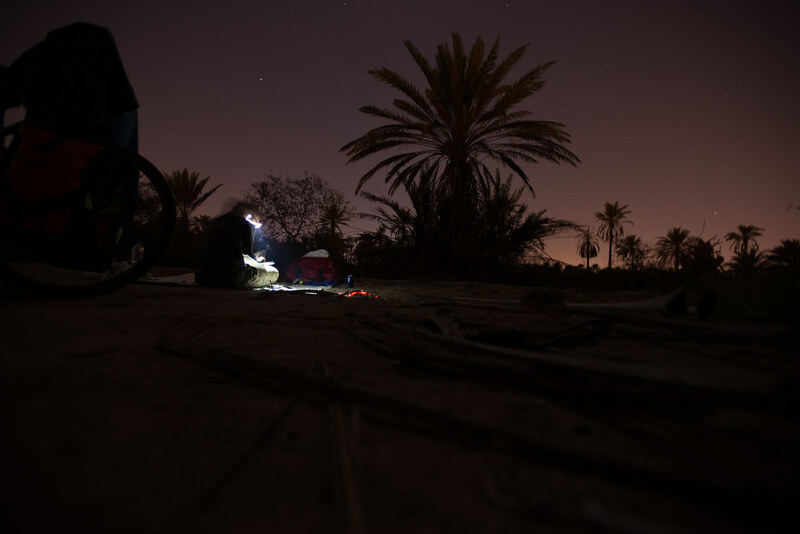 Since we set up our camp in the dark, we didn’t have a great idea of where we were, or what was around us. 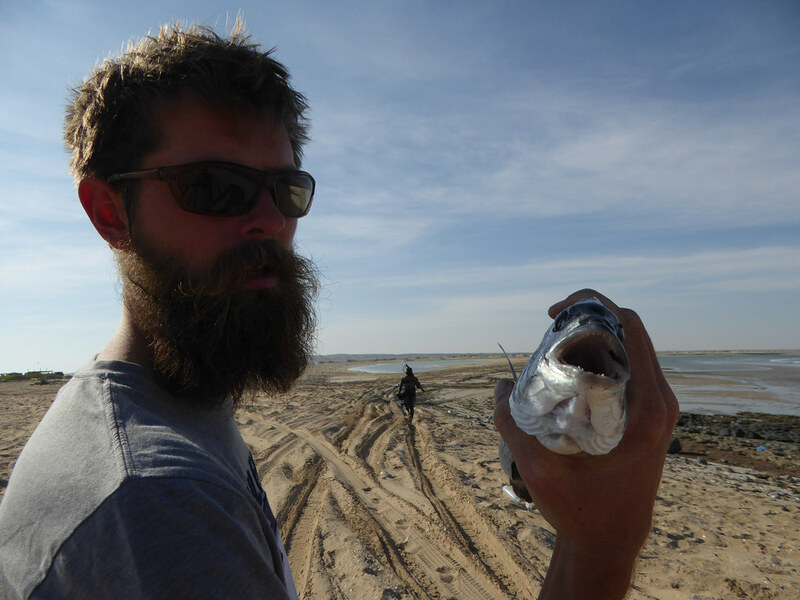 We had hoped that no one would stumble upon us and that we weren’t in a busy area. However. after 10 minutes or so a truck approached. 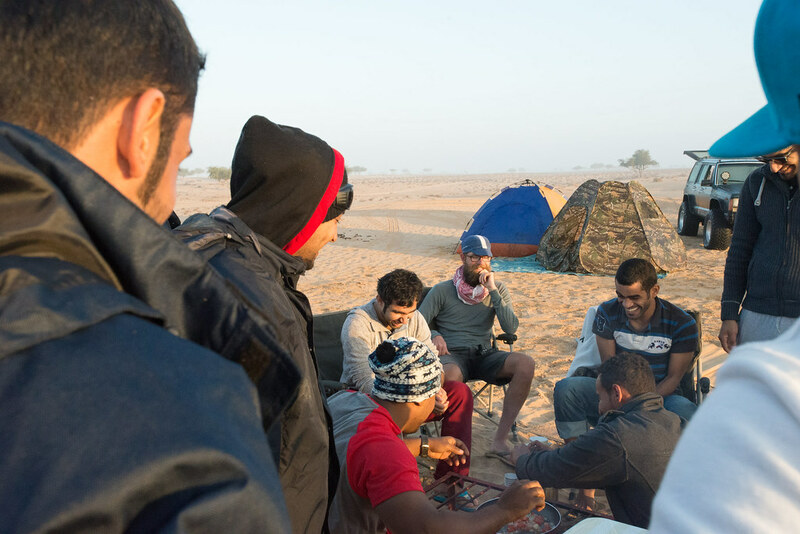 Now, it’s been six months since we began the trip and the way we feel when we see someone coming over to our camp at night has changed dramatically. Partially because of where we have been travelling, but more just because we are more comfortable with wild camping after 6 months on the road. At the beginning of the tour we would have been worried about someone telling us to move or would have worried that they were up to no good. Now, more often than not a night time visitor to your camp will be either 1) curious and just interested to see who you are and where you are from OR 2) want to invite you to their house or to give you some food, water, or bestow some other kind of kindness on you. Our Christmas night visitor was both, he swung around to ask if we needed anything and asked us where we were from, he then drove off only to return with orders from his father to bring us back to their home. We had already set up camp, so we stayed put, but it was a example of the kindness we found throughout the entire country. 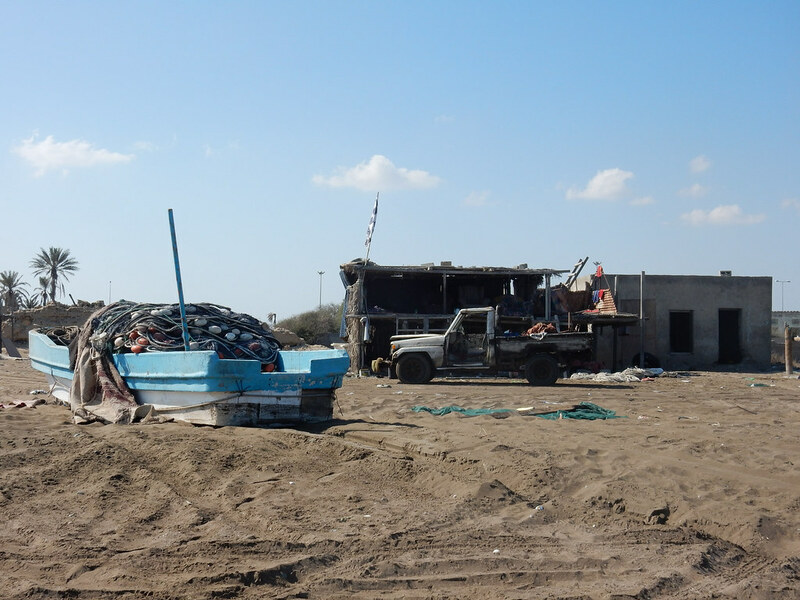 The next morning there were a few trucks passing by our tent, and one stopped by a walled area and beckoned us over. 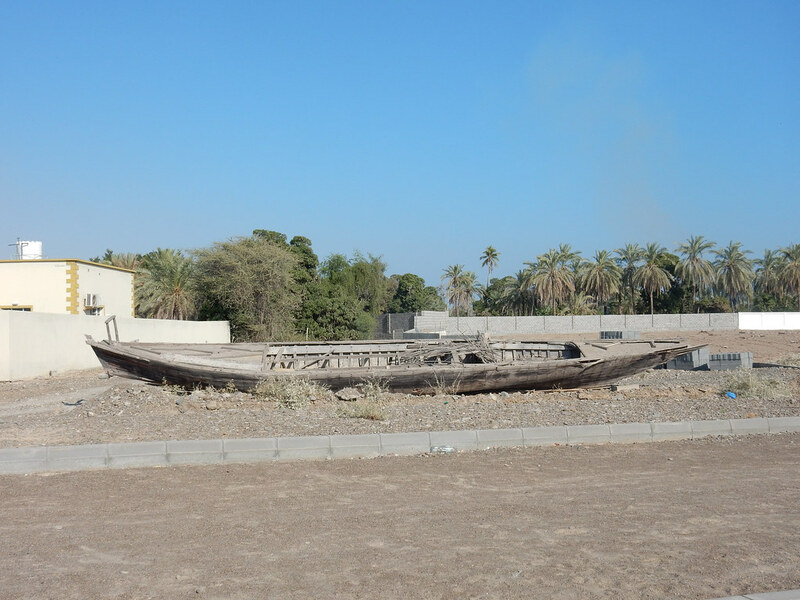 The owner had a little garden filled with date palm trees and a little picnic area behind his gate. 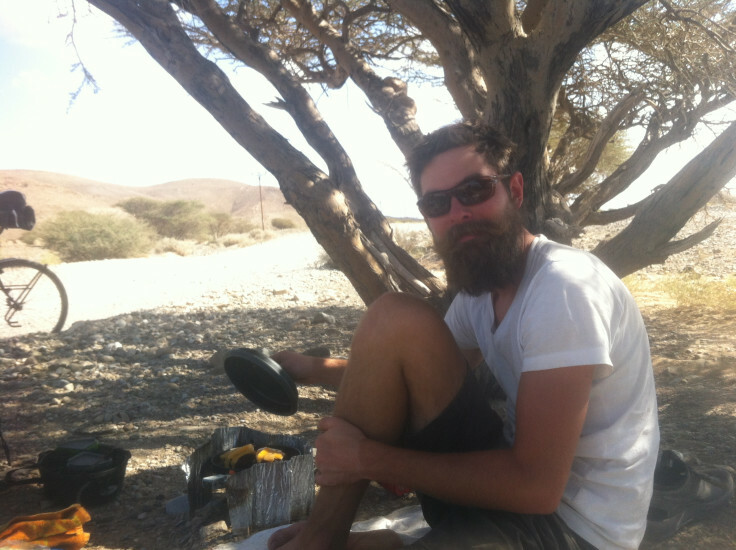 He gave me the grand tour, showed me where he hid the key, insisted we stay the night there (it was 7 am at this point). 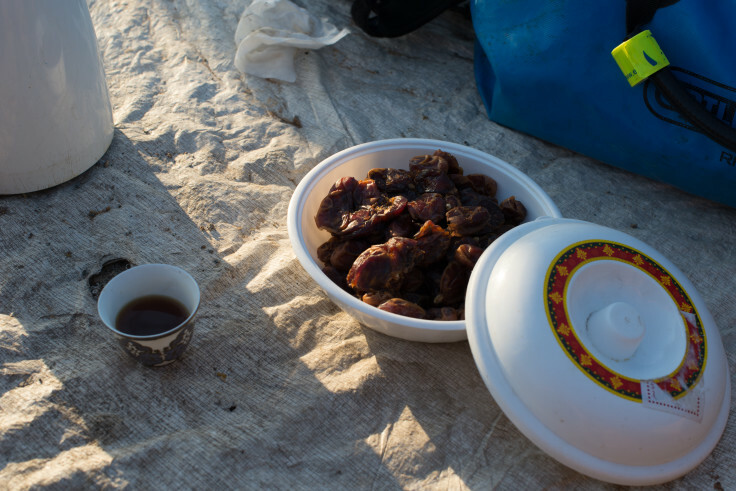 Next up was the Omani coffee and bowl of dates which he sent me off to share with sleeping beauty in the tent, as Claire had not awoken from her slumber (the excitement of Christmas wore her out). We hit the road and flew towards the coast, with the sun on our face and the wind at our back it was some of the fastest kilometres we have picked up on the trip so far. 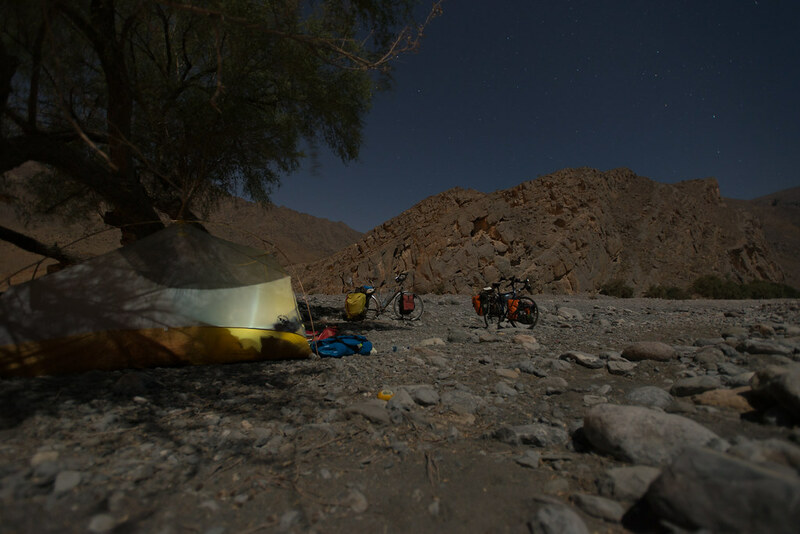 The highway between Hatta and the coast was smooth generally with a nice shoulder for cycling, but was otherwise uneventful and without much to see. We headed to Shinas and stuck to the coast for the a few days. The coastline was beautiful palms on one side and sandy beaches on the other. The coastal area is certainly the most developed area of the country, and I would hazard a guess that the majority of the country live within 50kms of the coast. 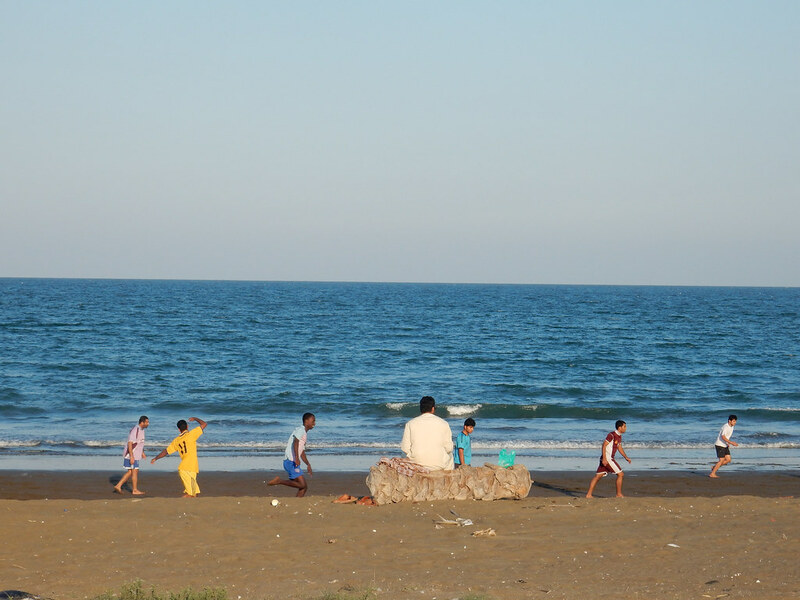 The beaches were alive with activity; fisherman were tending to their nets, and boats, children were playing football everywhere, every 500m there would be a new game and on the other side of the road families would sit in front of their homes, that were interspersed with date palm plantations, watching the kids play. There were also small street food stalls cooking BBQ kebabs every few hundred metres. 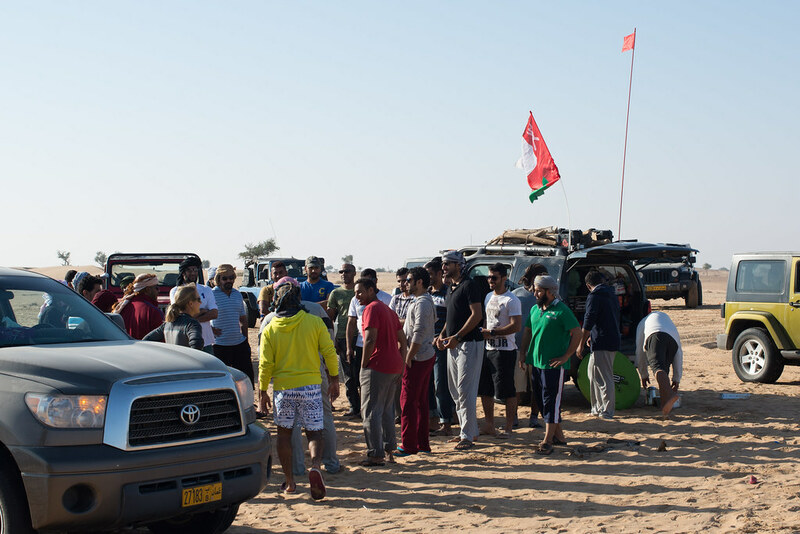 Riding along the coast I noticed that there was more diversity in the Omani people than I had expected, there was an especially large amount of Africans. 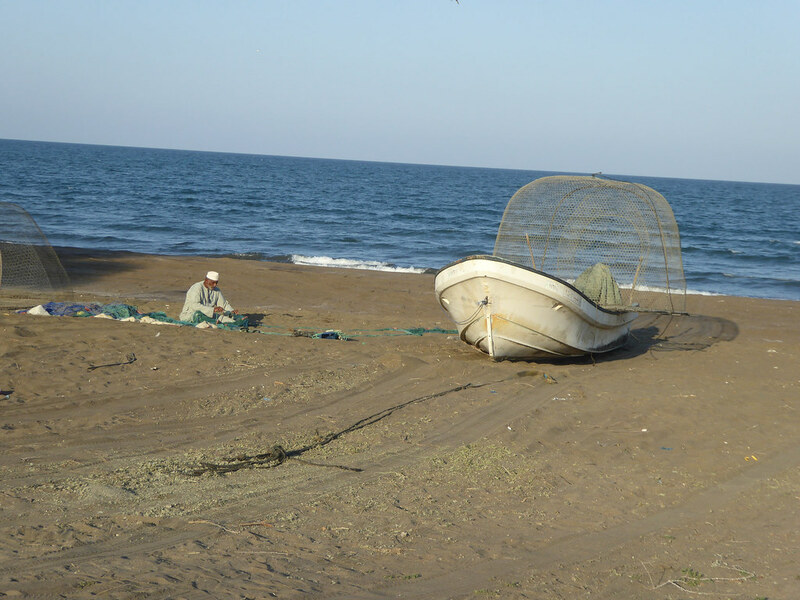 We later learned that this was because of the area which Oman use to control stretched from the southern tip of Iran down the coast into Africa as far as Tanzania! 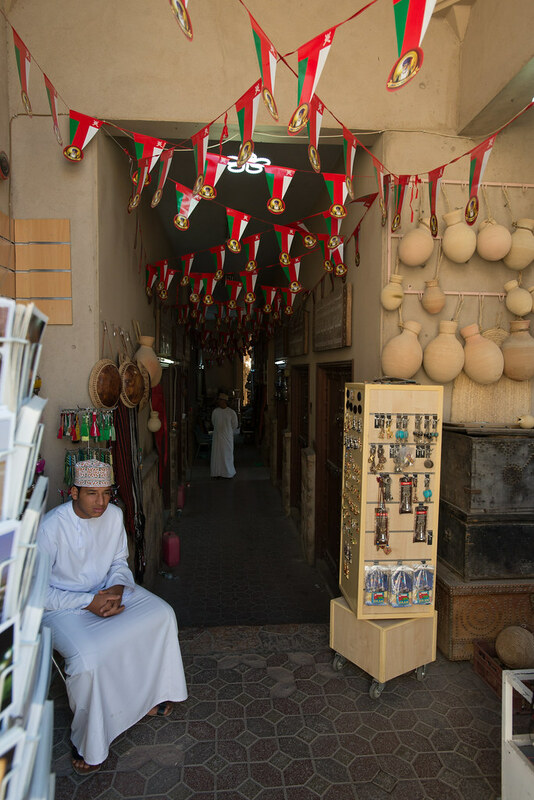 This also explained the ‘kuma’, the round pot shaped hat with elaborate embroidered patterns, which originates in Africa and is worn by many Omanis. 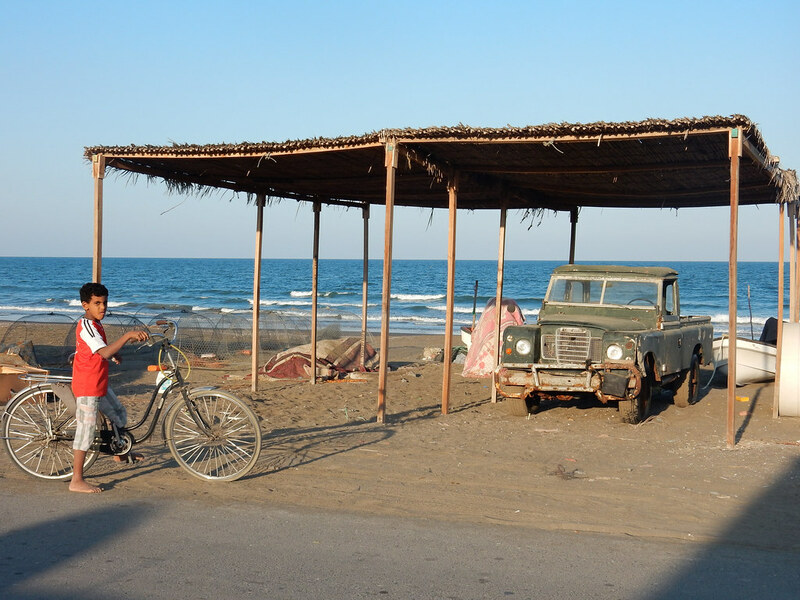 We had the chance to stop and swim in Suhar along the way at a lovely beach with public showers and changing rooms. 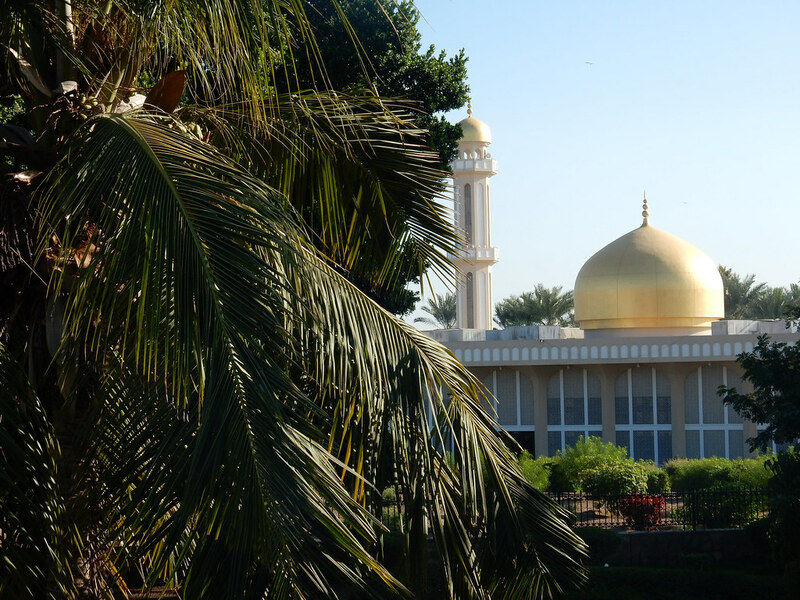 It was picturesque; with blue, blue skies, palm trees and a nice mosque on the beach front. The gulf was teeming with life, even on a short stroll along the beach you would often see a school of fish swimming a few feet away in the shallows. We continued along the coast and alternated between the large new coastal road (straight, fast and freshly paved; which was nearly always empty) and the small seaside road (less direct, slow but far more interesting). 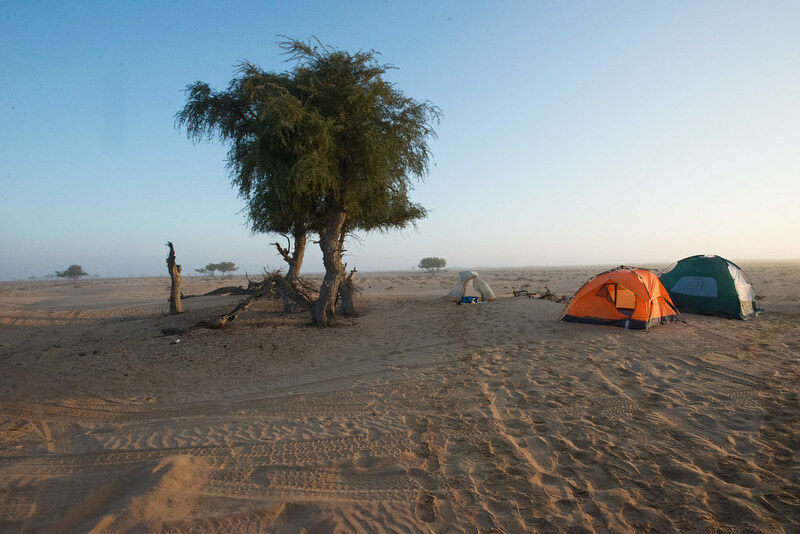 One night we camped among the palms just off of the beach, which was spectacular as we were treated with a great sunset, a bright moonlight night and then a curtain of stars. 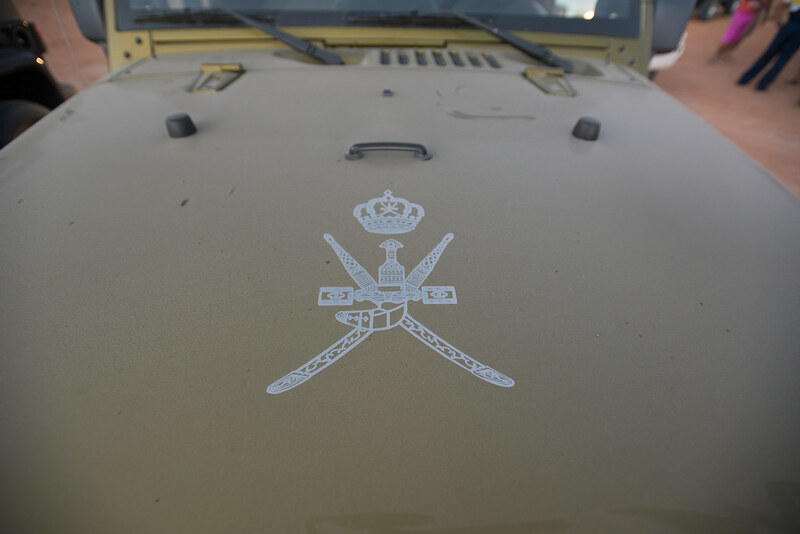 One of the greatest things about our time in Oman was how clear it was. Always. I’m talking no clouds in the sky, both day and night. 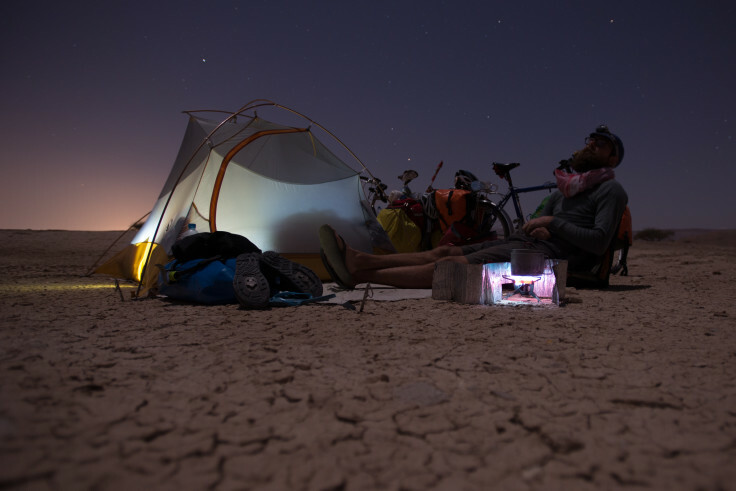 We had unforgettable starry nights, and we happened to be camping during the phase of the full and nearly full moon, so often at night we didn’t even need flashlights. 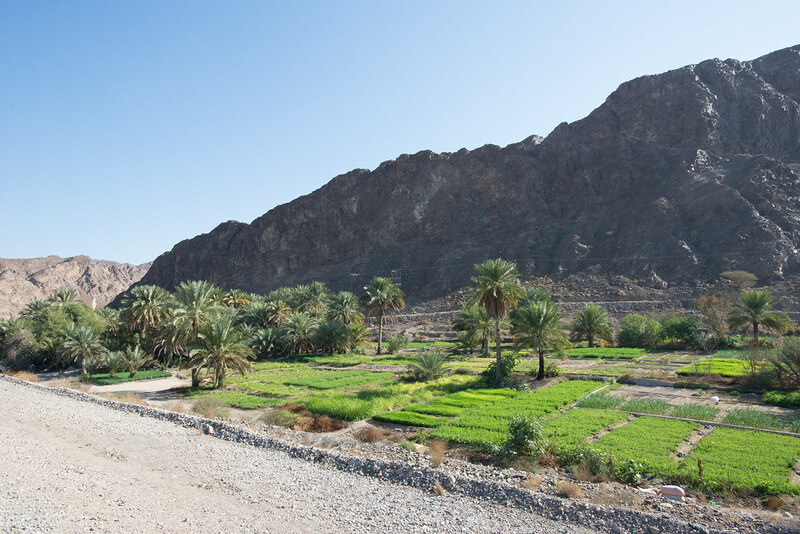 After a few days on the coast we headed inland from Suhar towards Yanqul into the Al Hajar Mountains. 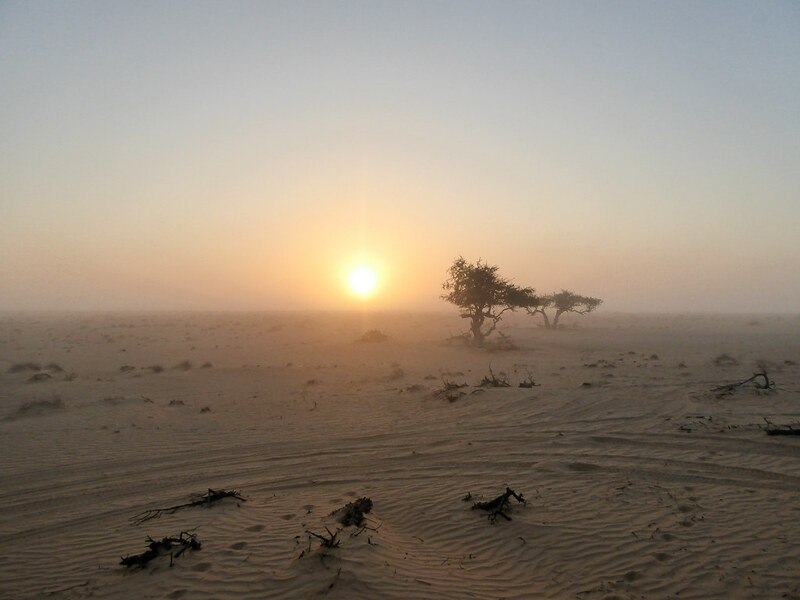 As we headed inland away from the coast the temperature increased, and tree cover decreased. 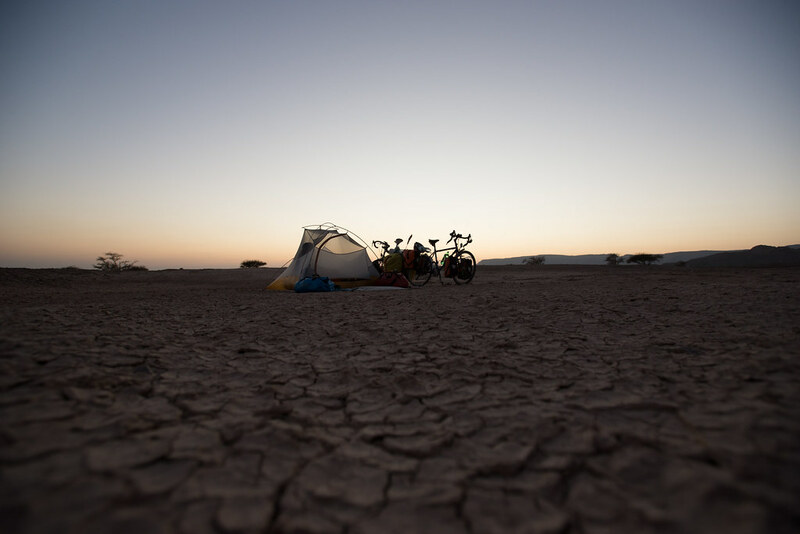 We had already gotten into some different habits regarding our cycling start times and breaks; we were getting up earlier to get some distance under our belt before lunch, we were also taking longer breaks at lunch to shelter from the blazing midday sun. Now in the mountains these habits were really essential, without an early start you couldn’t get too far before the serious heat of mid day, also our lunch breaks were extended to 2 or 3 hours because of the sun and heat. 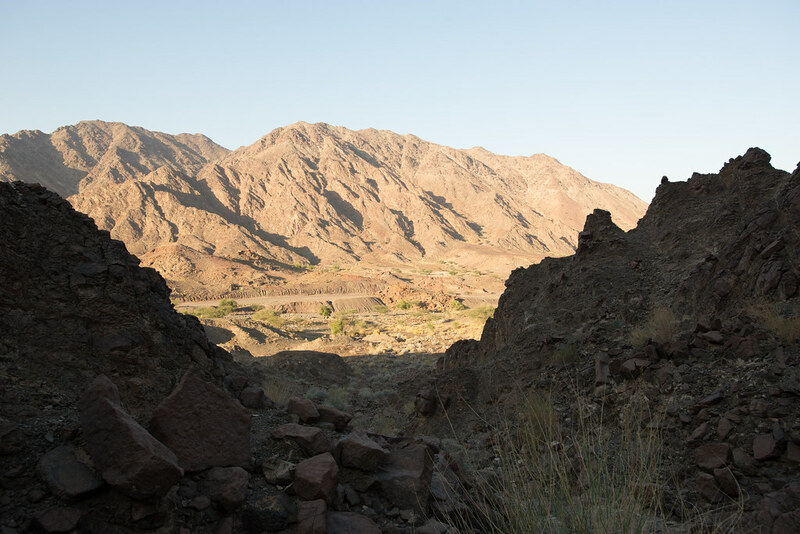 The turn into the mountains was a spectacular decision, and where we would end up spending the majority of our time on the bicycles in Oman. 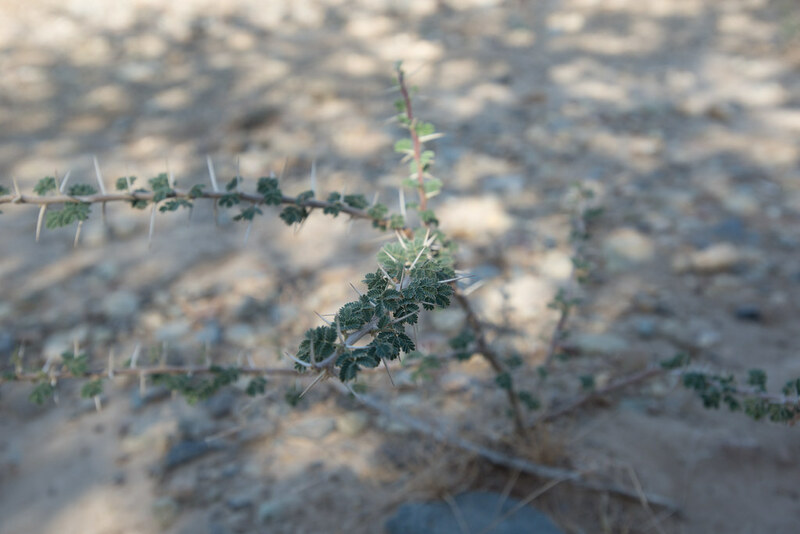 The landscape was extremely rugged, you could clearly see the geological formations and make up of the land as there was little vegetation, sparsely spaced thorny bushes, some short thorny trees with tiny leaves and no real ground cover. The mountains looked and even felt ancient, made of highly fractured hard red/pinkish stone with veins of soft white calcium deposits. This combination proved to make climbing a bit treacherous as large chunks of stone would come loose with often the lightest push. Also when walking on the mountain face your own steps felt as if you were walking on hollow material accompanied by echoing thuds with each step, and an uncomfortable sense of instability rather than a sense of solidity and strength that generally comes with walking on stone. It was kinda fun! 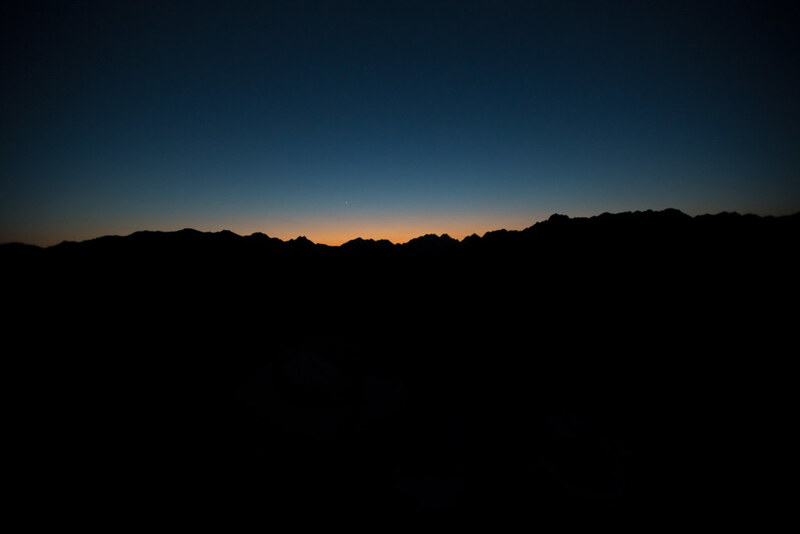 The mountains proved to be a bit cooler than the coast at night, but it was truly the perfect temperature for sleeping. We still kept the fly off at night, as it was plenty warm, the chance of rain was next to none and we were able to sleep below the stars. Camping was a breeze as we felt safe everywhere we went, locals did not seem bothered by us pitching our tent near a town, or in a busy area, it seemed that anything goes. 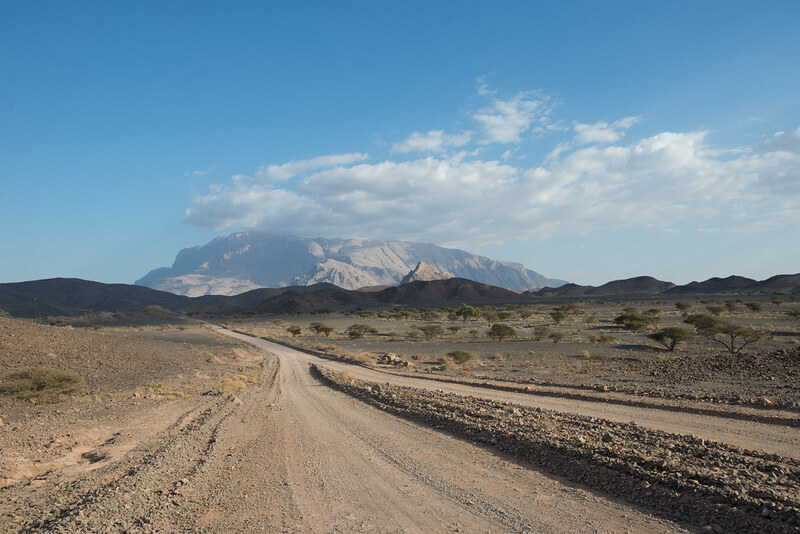 As far as elevation the Al Hajar mountain range is fairly low lying, so our climb over the range was not so challenging, traffic was also fairly sparse and calm despite it being a main highway. 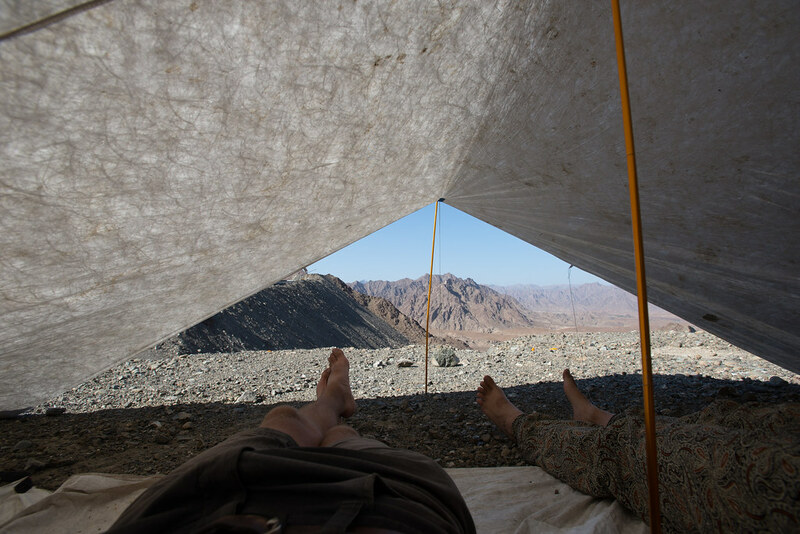 During our ascent we paused for lunch on the mountain, however, the area was completely devoid of trees or vegetation and with no shelter from the sun to be found we made ourselves a little tent with our tarp to hide from the sun. I guess the combination of having two bikes and a big white tent on the side of a bare mountain would draw some attention anywhere, but we managed to have curious locals pull in and have a chat every few minutes. We received invitations to peoples homes, to ride camels, for dinner, and to have henna tattoos. 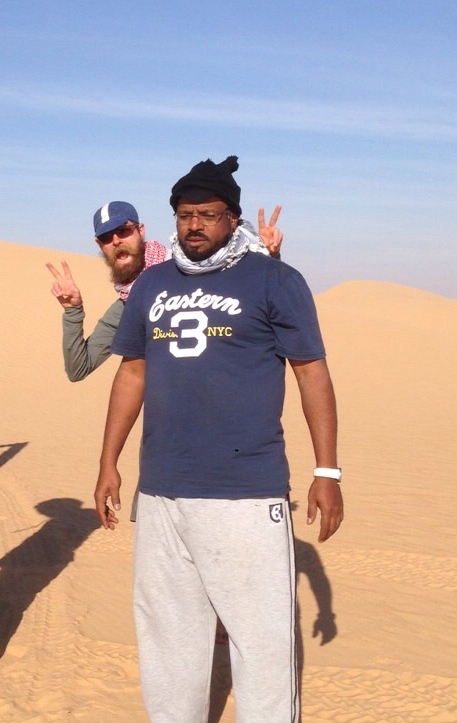 It was also here, on the mountain road to Yanqul that we met our new friend and member of ‘team cool’ Hamed! 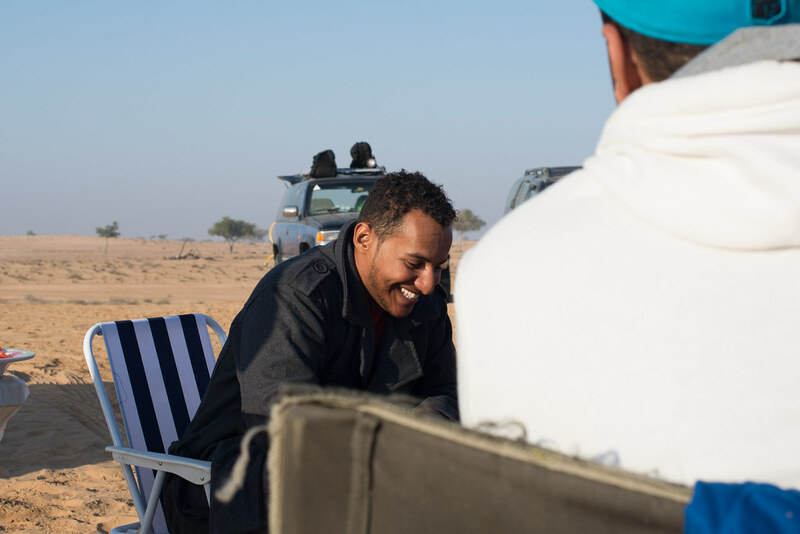 Hamed was a friendly and smiley Omani who was impressed and excited by our little journey across Europe and Asia, and after a few minutes of chatting invited us to a desert crossing a week later. It was a brief meeting, but a good one, sometimes you just get a good vibe from people. We exchanged contact info, and hoped that we would connect again; we would later meet for a great adventure! Following our break on the mountain side we summited, and descended into the west. 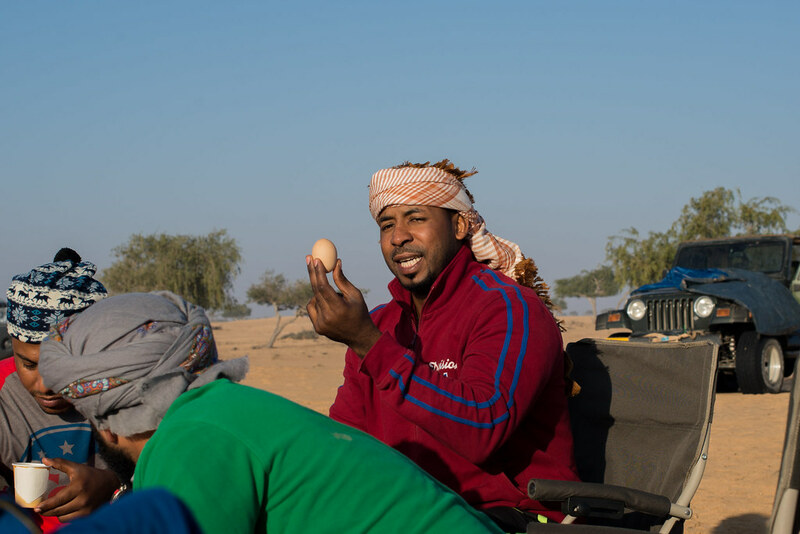 One of our visitors invited us to stay the night with them, but we never managed to find them, so if you know Sultan or Yousif al Badi from Al Madam let them know we were sad that we never got the chance to see them again. 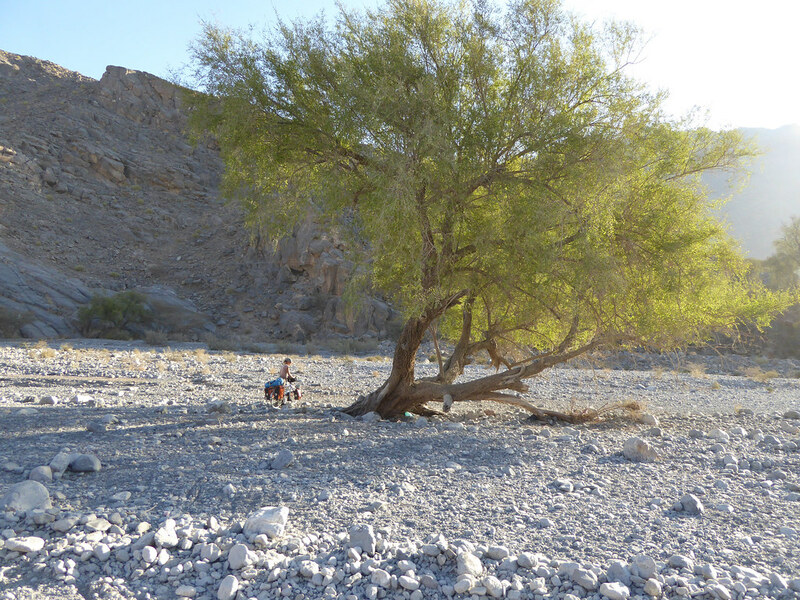 We stopped for lunch and hid under the shade of a spiky tree, no sooner than we had sat down were we beckoned over by a passerby in their car who gave us some yogurt and dip, and insisted that we visit him at his house. After lunch we packed up and searched out our new friend. 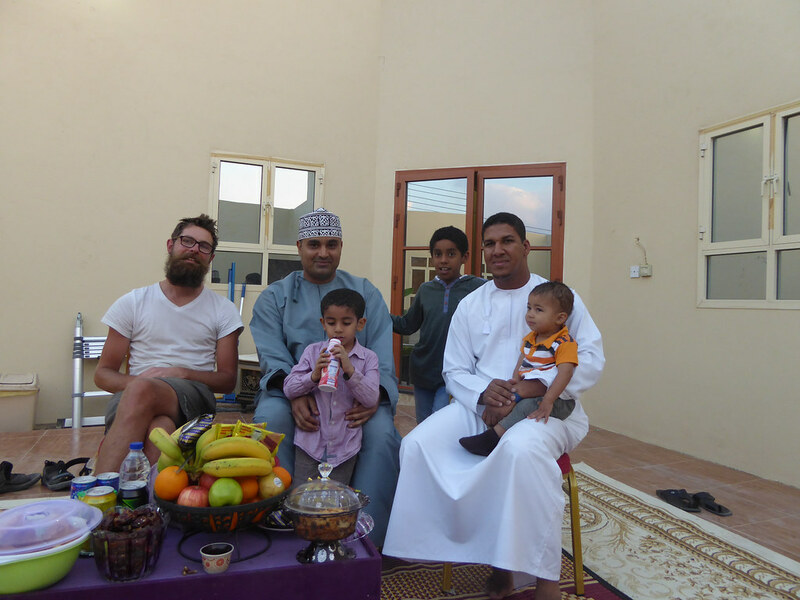 It was a short visit with a very friendly fellow his wife, son, mother and brother where we spoke a bit about our trip and our time in Oman and enjoyed a plethora of fruit, drinks and dates. New years was not even on the radar for the family, and it took some time to explain what we were asking them when we said “Do Omani’s celebrate New Years Eve today?”. 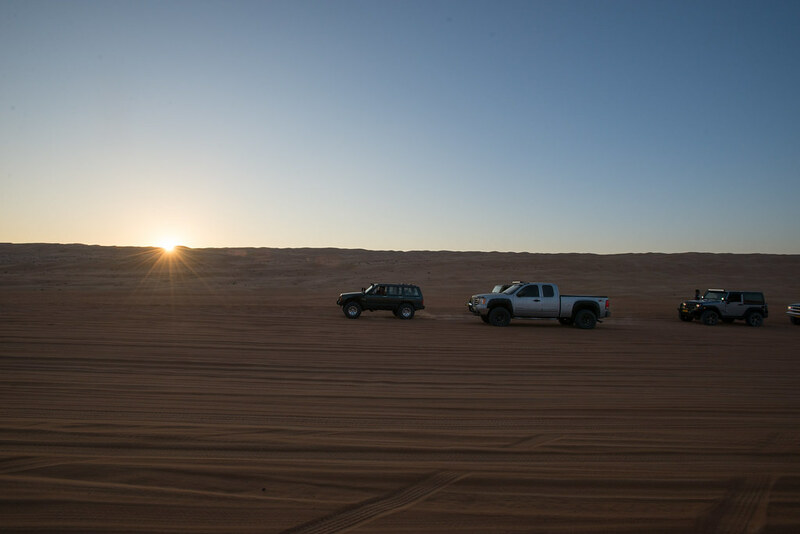 We couldn’t stick around for long as the sun was setting and we had realized that we were not on the road to Bat, but on a road parallel to the one we needed to be on only 16km to the south. 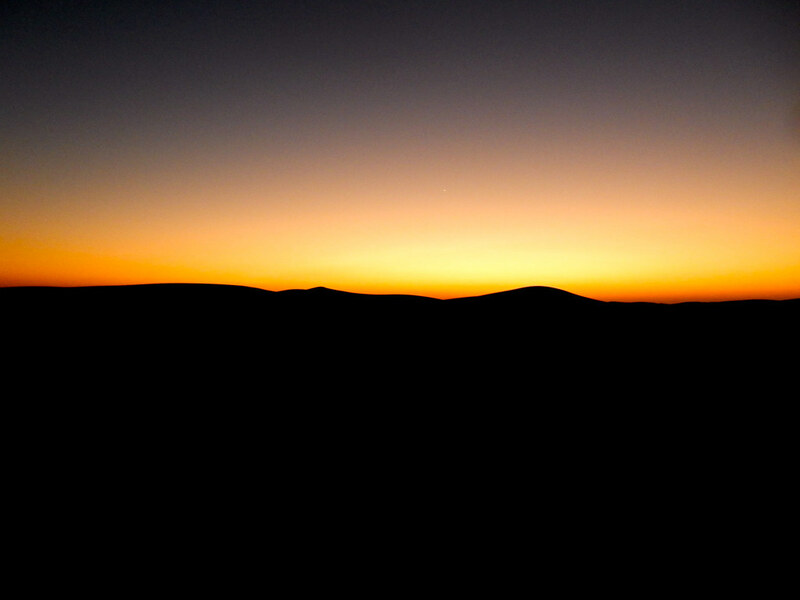 With the sun setting we headed back to the highway and for the first time on the trip we cycled in the dark. Luckily the roads were well lit and we managed to navigate the roads with little difficulty. 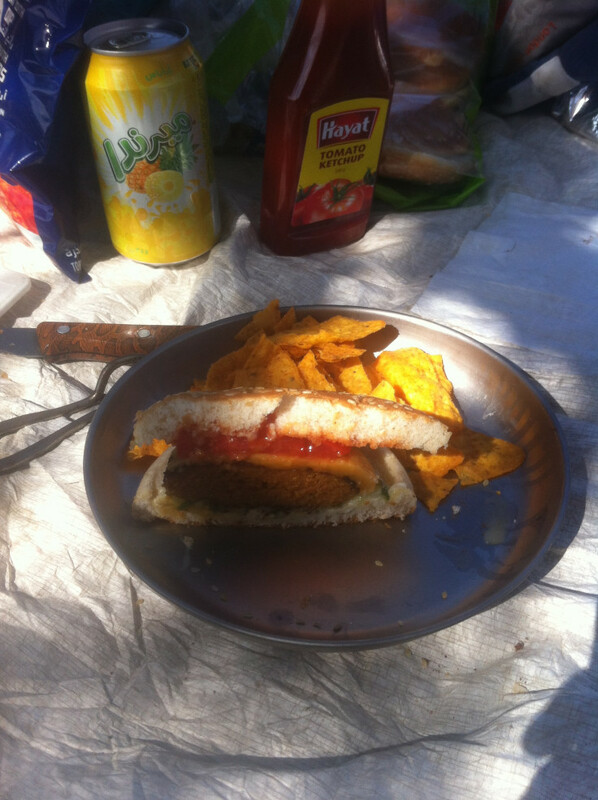 We spent New Years Eve on the outskirts of a small town in the sand, setting up camp in the dark, and to celebrate we made cheeseburgers (that’s a big deal for us by the way) with all kinds of other goodies, listened to music on the radio and went to bed around 10pm. We’re party animals. It was a great night. 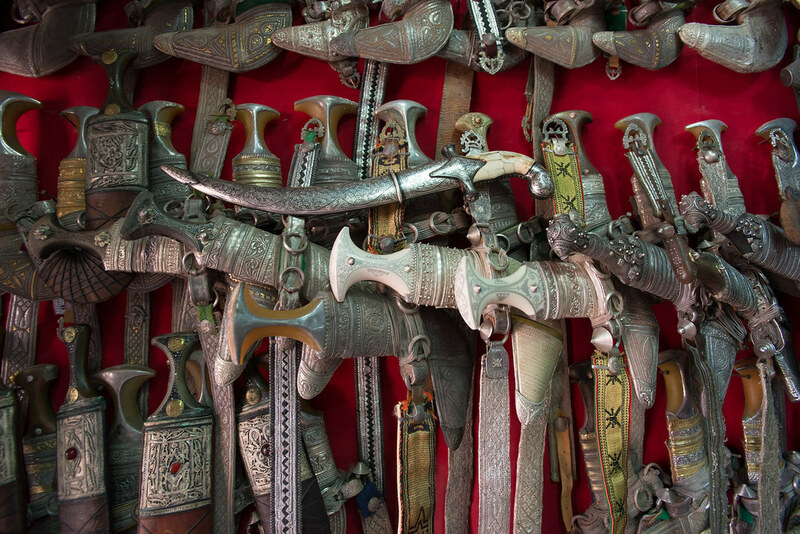 Consumerism is certainly alive and well in Oman. Big brands and big malls are present here on a smaller scale than in the UAE, but still in a big way. However, what was a bit of a shock was how americanism has seeped into the country. 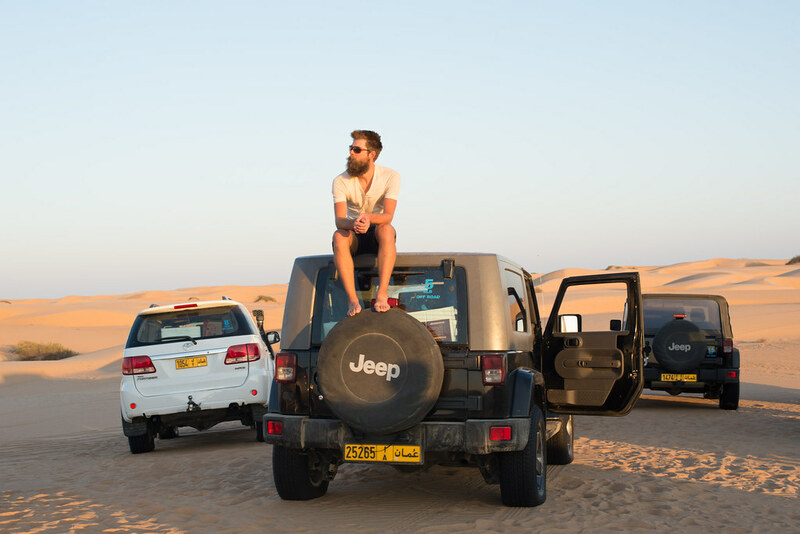 Big US cars are commonplace in Oman, with many people importing cars from the states (Hamed’s car was a used car from Texas for example). Pepsi and Mountain Dew were everywhere, and some other pretty bad food had made it over from the states including processed cheese and squeezable cheese. Ugh. It was a confusing dynamic for a North American like myself. 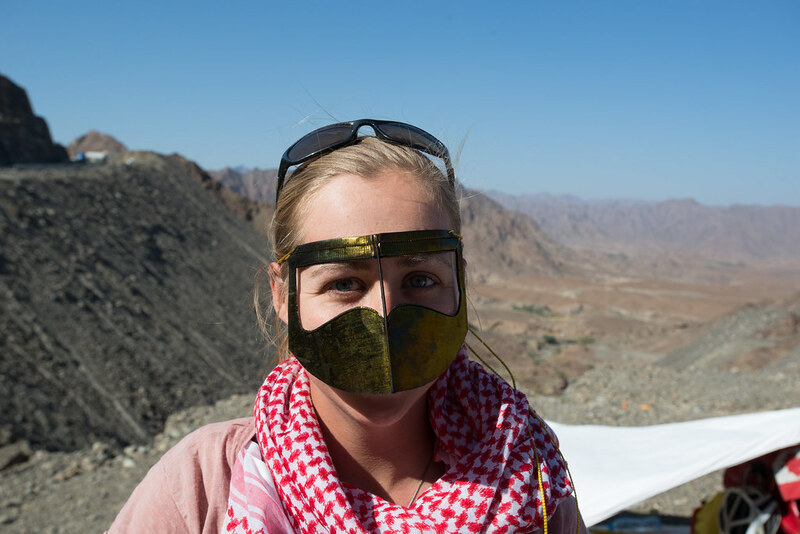 On the one hand the environment and culture was unlike anything I had experienced before, and the Omani people are proud of their heritage and traditions, and are keeping them alive. However, on the other there was a sense of familiarity that came with all the imports from America. 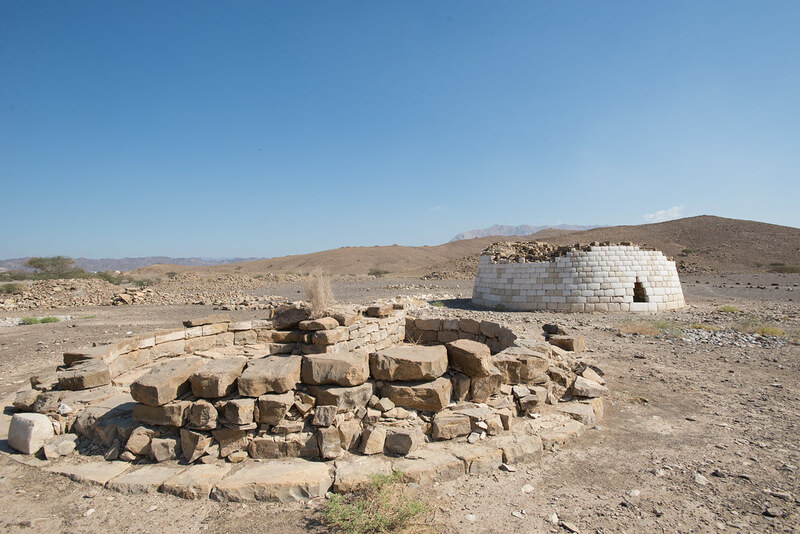 As we continued south east below the mountains we passed through Ibri and then the small village of Bat where we saw some interesting 3rd century “beehive” tombs. 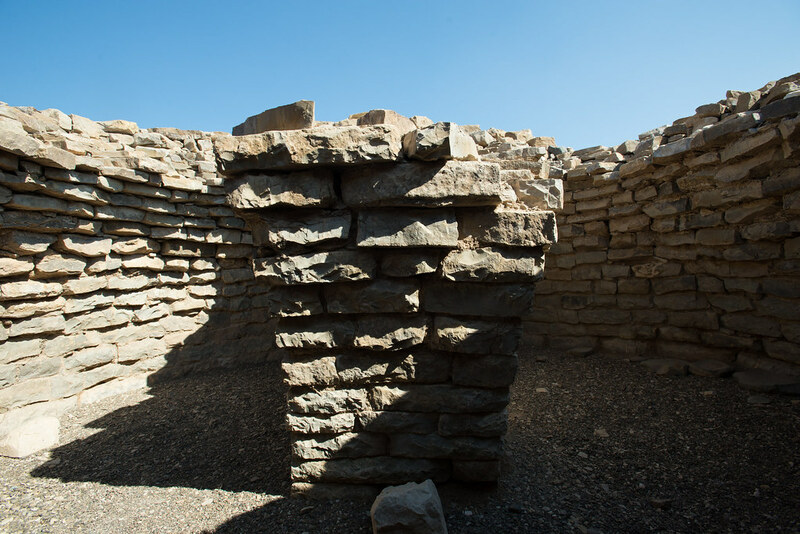 Named so for their shape, these tombs are constructed of dry stone masonry and can be seen for several hundred kilometres on the peaks of the foothills of the mountains. 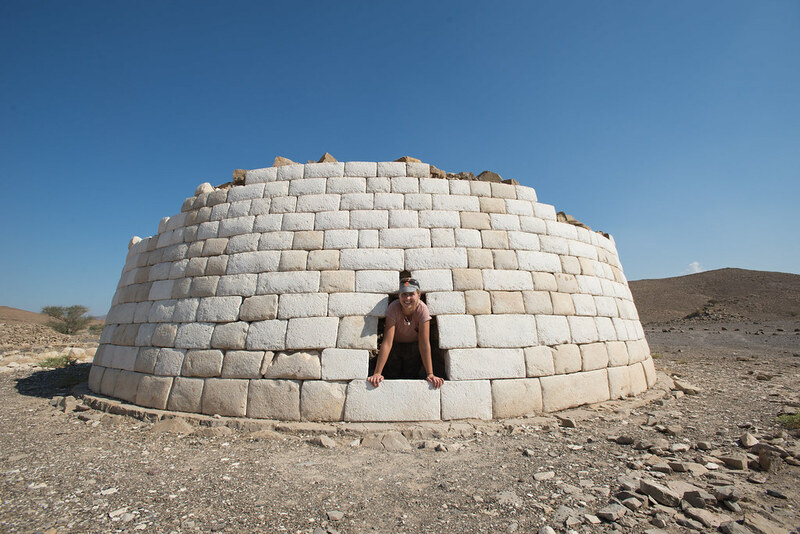 Of all the tombs, of which very few are still completely intact with the majority of the tombs in complete disarray with only the lower courses of stone work in place and identifiable. 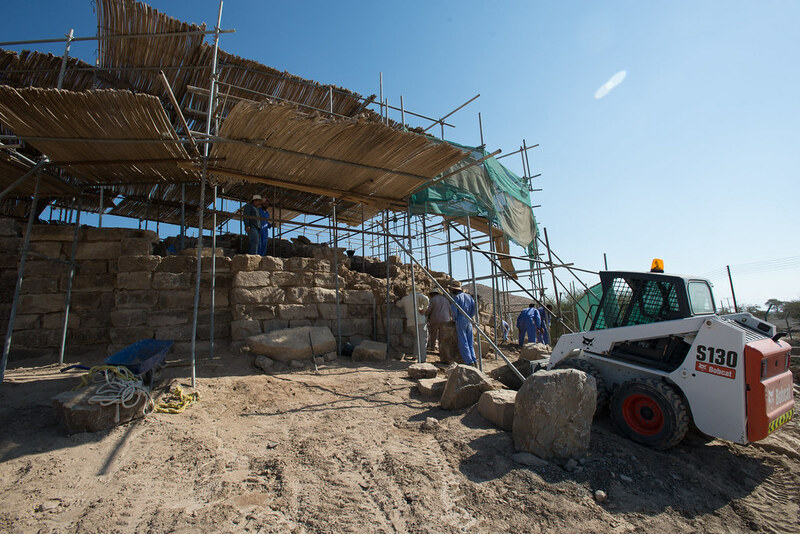 On the main archeological site a very large tomb, unique to the site, was undergoing restoration work. Since the work site was open, and with my interest in historic buildings and restoration work, we wandered in to see some questionable ‘conservation’ work in action. 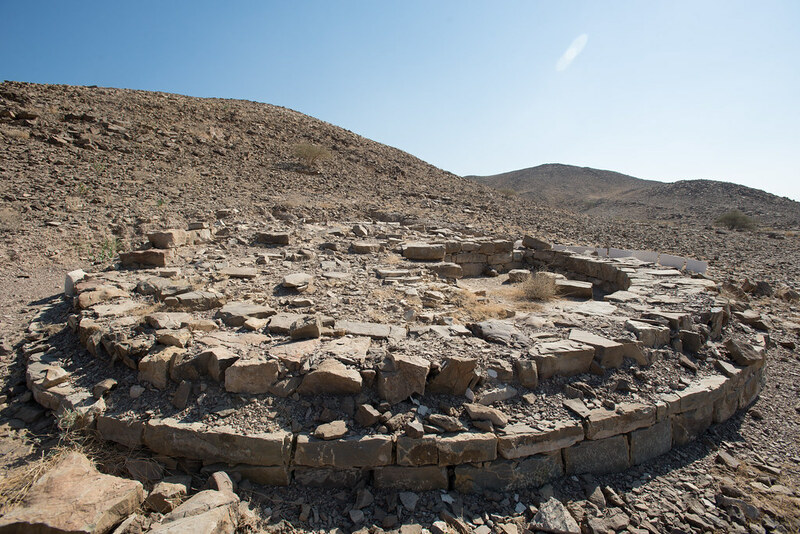 The tomb was in shambles simply from the sands of time, however, you could see that the stones had undergone an archaeological survey with each major stone having its own identifying marker. This same fastidiousness and attention to detail was not further reflected by the care given by the workers on site. 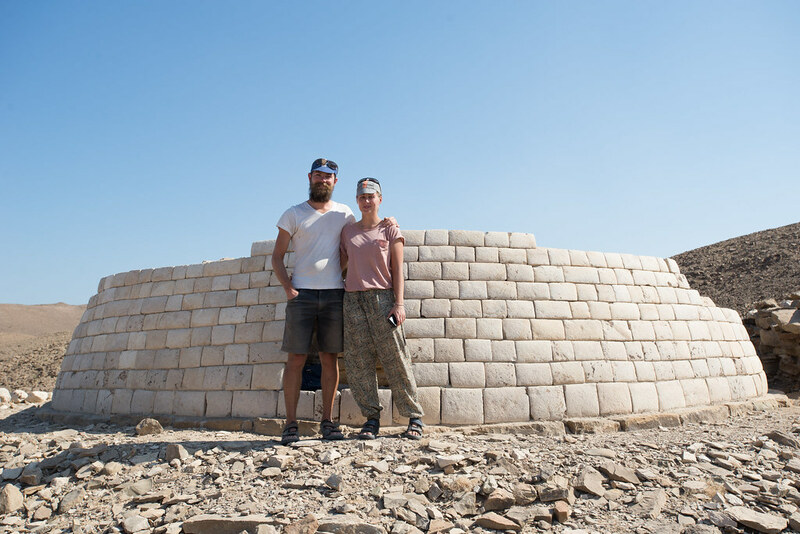 With a bobcat on site pushing pulling and dropping rocks, a light touch was left in the previous stage of conservation. 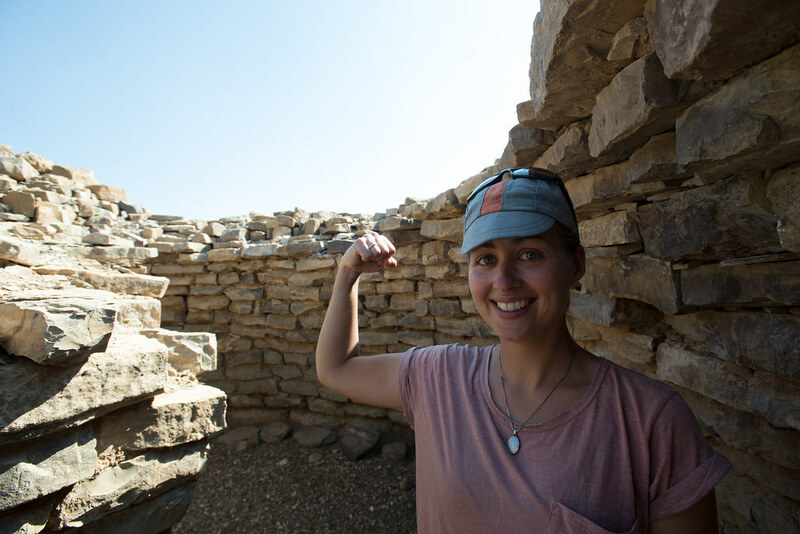 Rocks were being chiseled by hand to be made to fit, and others were being literally thrown on to piles. Just rocks? not really, these stones were collected in the 3rd century and form a site dubbed to be of international significance by UNESCO. It was disappointing to see, especially in a country which has vast resources to obtain qualified professionals and regularly does draw on foreign expertise for local projects. 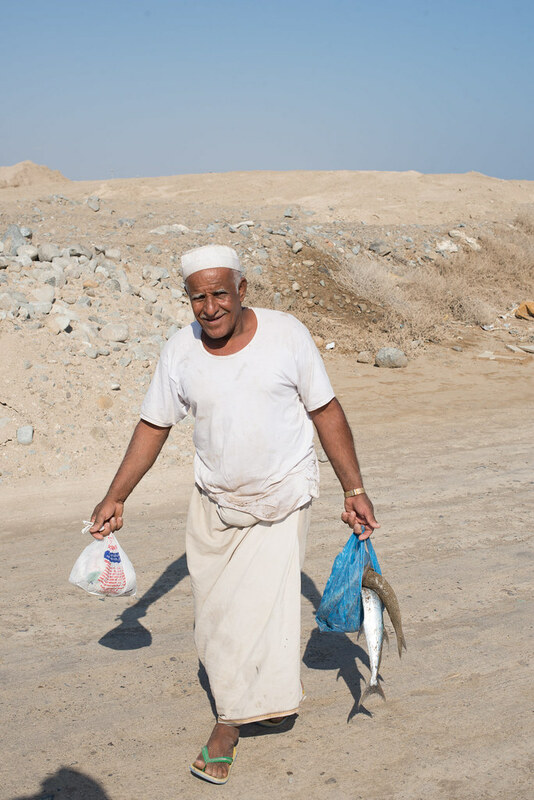 We bumped into an Omani archaeologist, Ibrahim, we had met the previous day while grocery shopping, which was nice, he was told by a friend on the other side of the village that two cyclists were looking around. I always find it funny when you enter a small town and know that you are news, and word has spread that two strange people on bicycles are riding around. 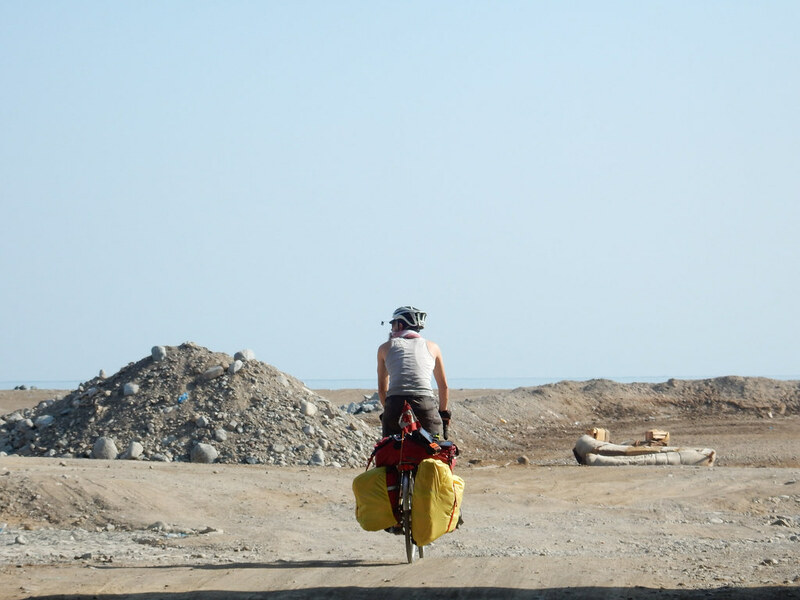 Our ride out of Bat was a bumpy one, as we were on our first lengthy dirt road since entering Oman. 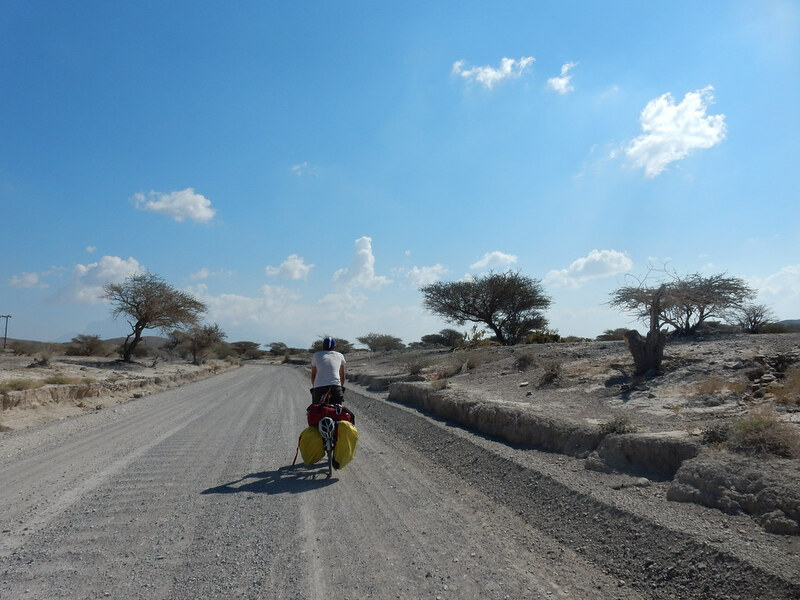 The heat was on as it was around midday, but despite the bumps, the heat, and the sand patches that force you to get off the bike and push, which make you go crazy, this was one of the nicest stretches we experienced in the country. 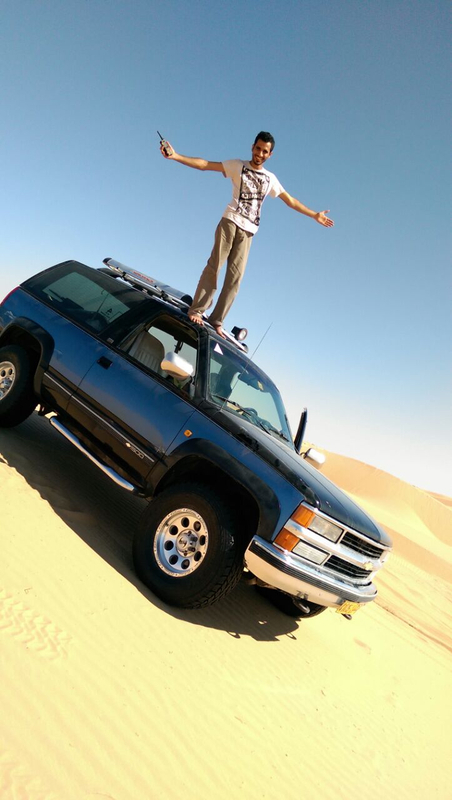 There were very few cars, the scenery was amazing and we saw some camels roaming around. 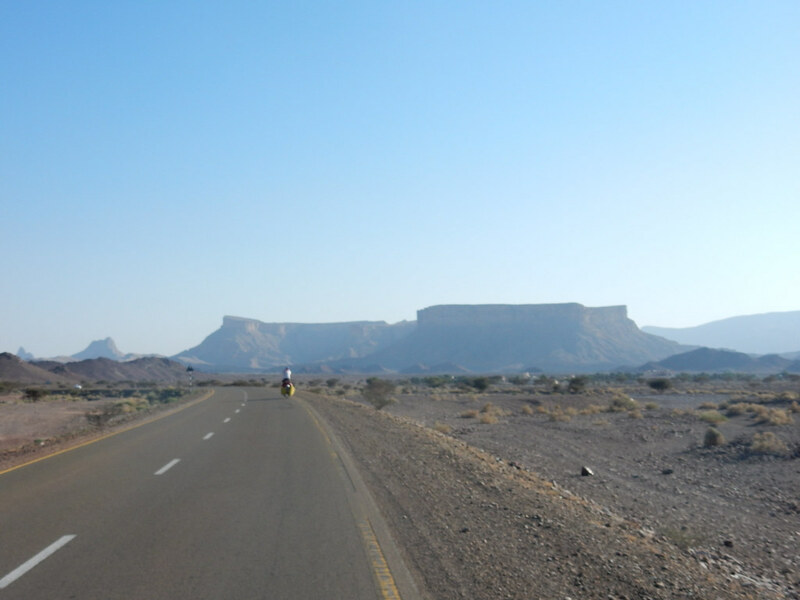 Being reunited with tarmac was welcome when we reached Ablah and then headed on the road towards Nizwa. 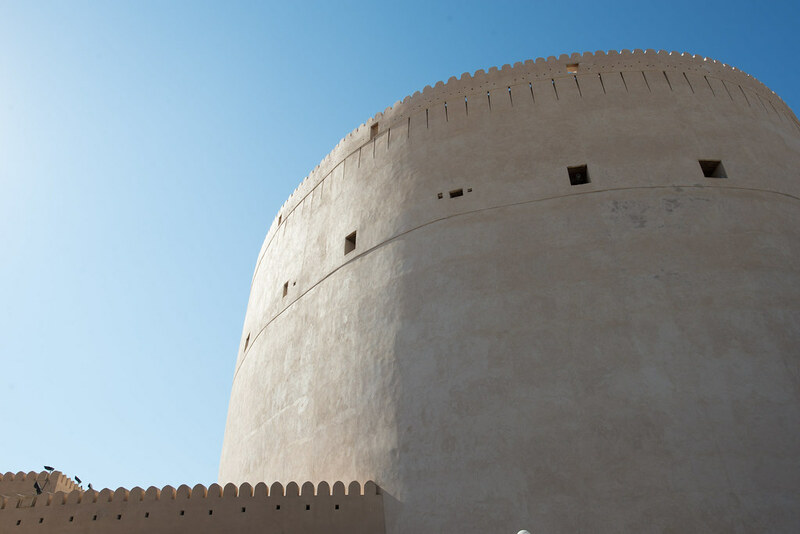 Nizwa is about an hour by car from Muscat, has an 17th century fort and a large souq (market) for both tourists and locals, and is therefore on the main tourist circuit. 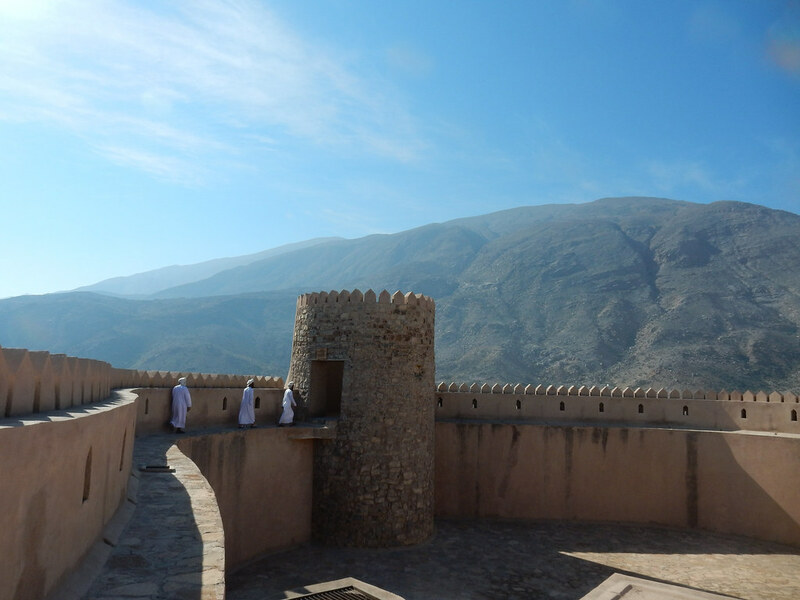 The fort and town were both a bit of a let down, we visited other towns which were far more interesting, picturesque and/or authentic than Nizwa. 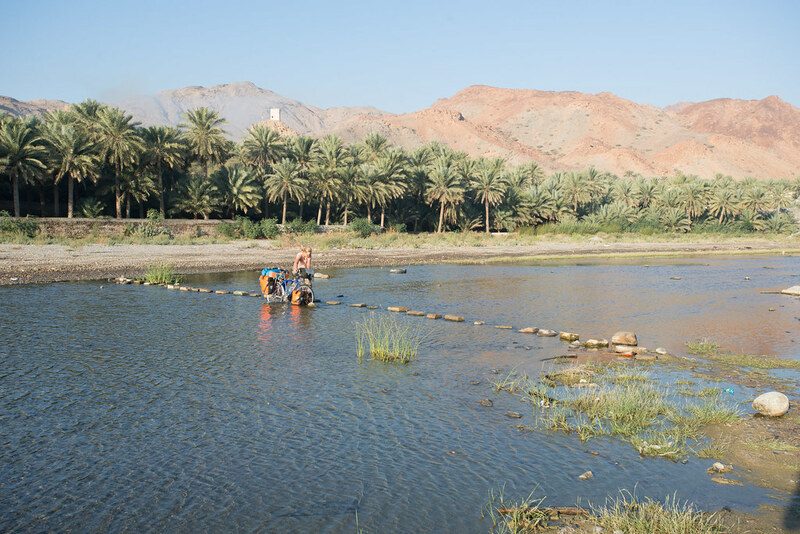 This area is certainly better known for the mountains and wadis (a valley, ravine, or channel that is dry except in the rainy season) which are pretty famous. 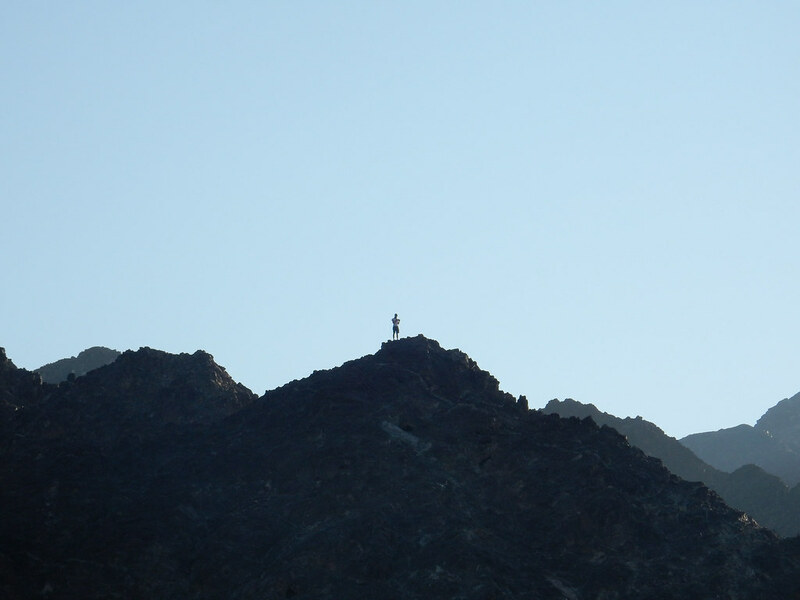 Jebel Shams (Mountain of the Sun), the highest mountain in Oman, was part of our original itinerary, but was scrapped due to time constraints. 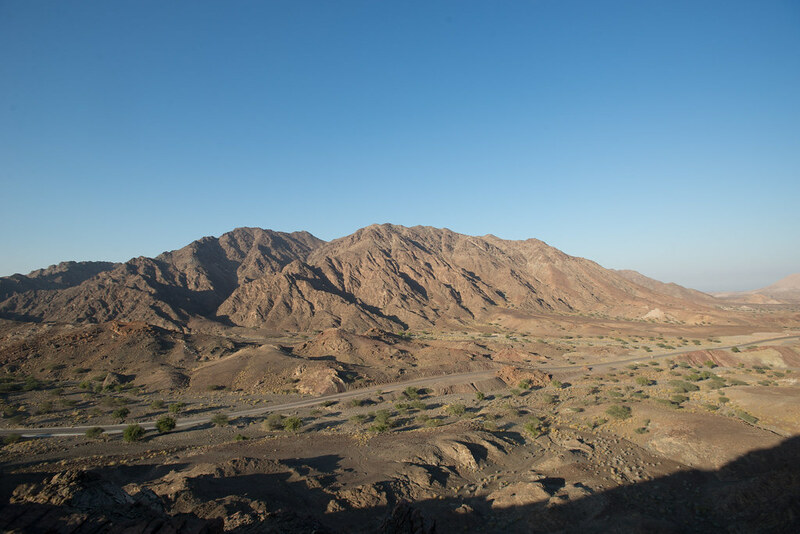 We managed to see a glimpse of the wadis and mountains while we passed through the region, if I were to return to Oman this region would be my first stop. 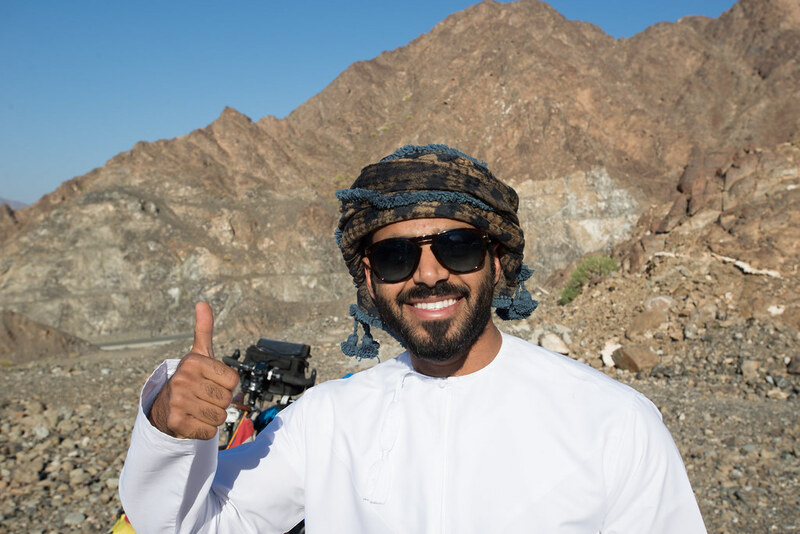 We had made arrangements to meet our new friend Hamed while on the road, so after Nizwa, we hopped on the highway and made a straight shot for Muscat. Camping had continued to be amazing each night, with a full moon that made it bright enough to cook and camp without a flashlight! However, Claire’s Thermarest had contracted a tiny hole from the thorns which meant each morning she would wake up with a flat mattress, and would often migrate over to the only other working mattress in the tent. Mine. Frustratingly the hole was too small to identify, and with few lakes or pools along the way we couldn’t even find the hole. 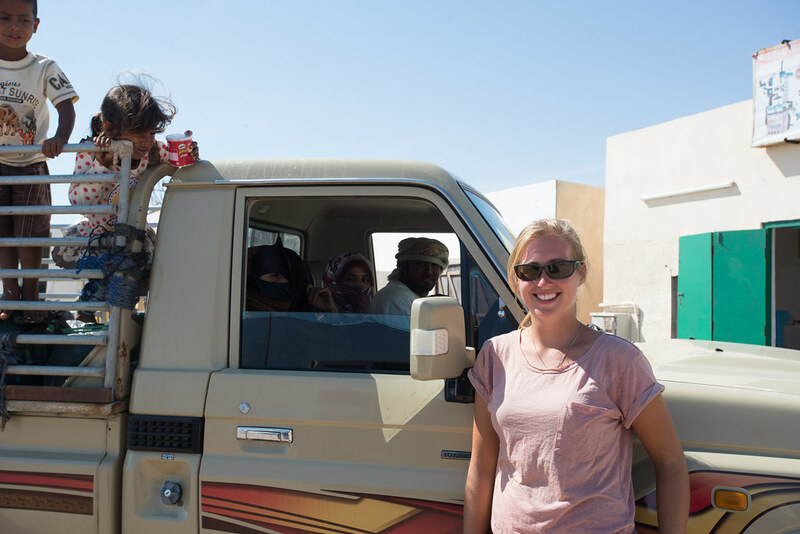 Amazingly, while we were on the highway towards Muscat, Claire came to a screeching halt on the side of the road. 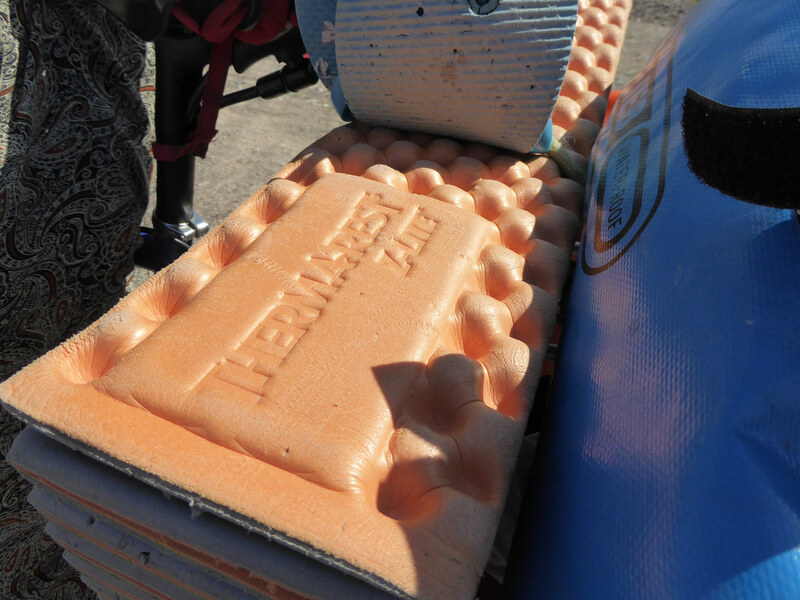 Confused, I quickly learned that Claire had found a Thermarest on the side of the highway! It was a non-inflatable z-lite. 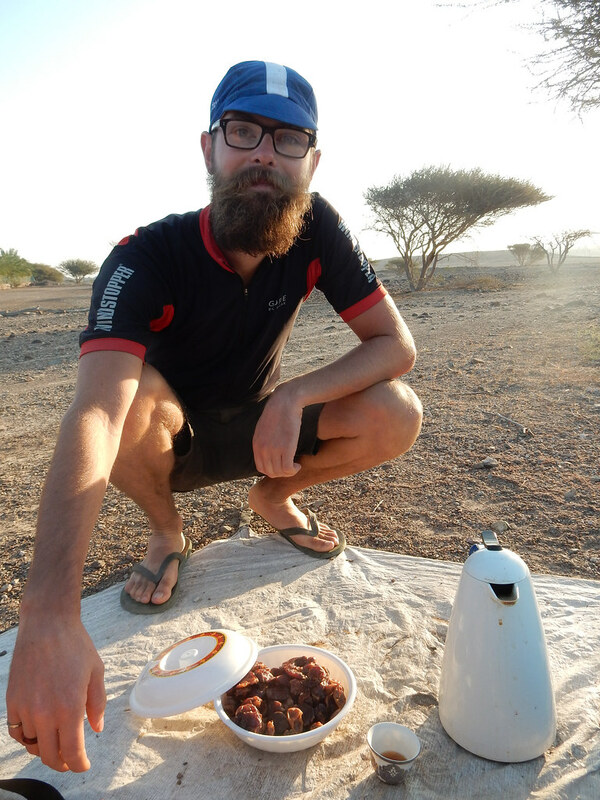 To find a Thermarest on the side of the road anywhere is a bit strange, on the side of the road in Oman is even stranger, and to find one on the side of the road in Oman when yours is broken, now that’s a miracle! 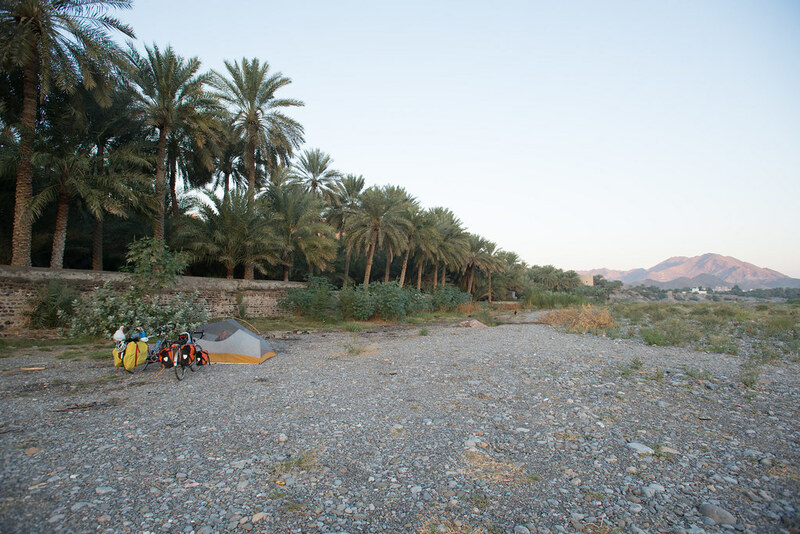 We had one last night of camping before Muscat, and we spent the night next to a river in a town called Bidbid. Our campsite involved crossing the river, and was one of the more memorable sites in the country. The river bed was quite wide, but mostly dry and was filled with families having picnics or relaxing. 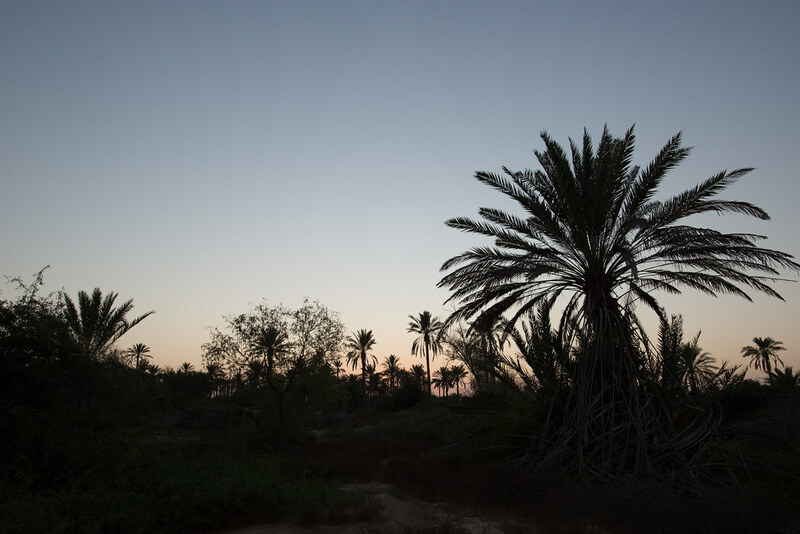 Surrounded by date palm plantations the site was both peaceful and picturesque. 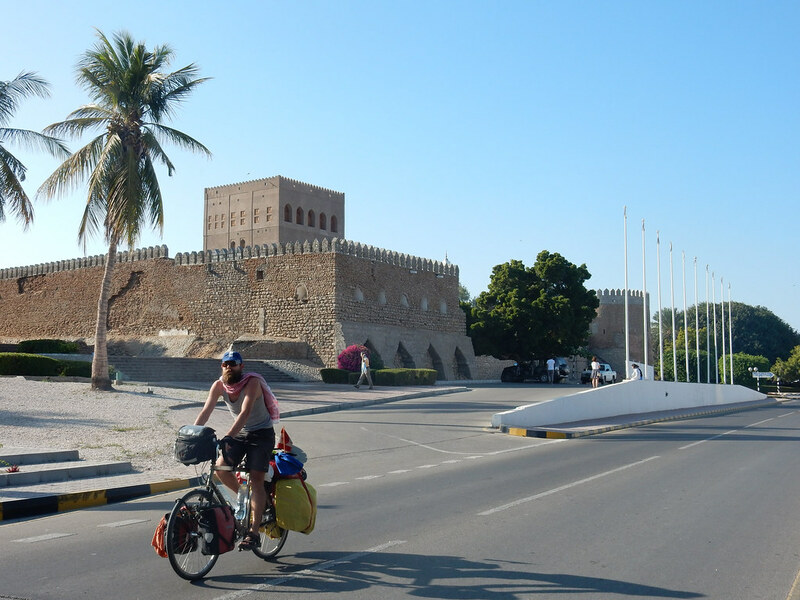 The final blast into Muscat was a little bit stressful as we were cycling in on the main highway and onramps and off ramps increase their frequency when you hit a city, which is never fun. 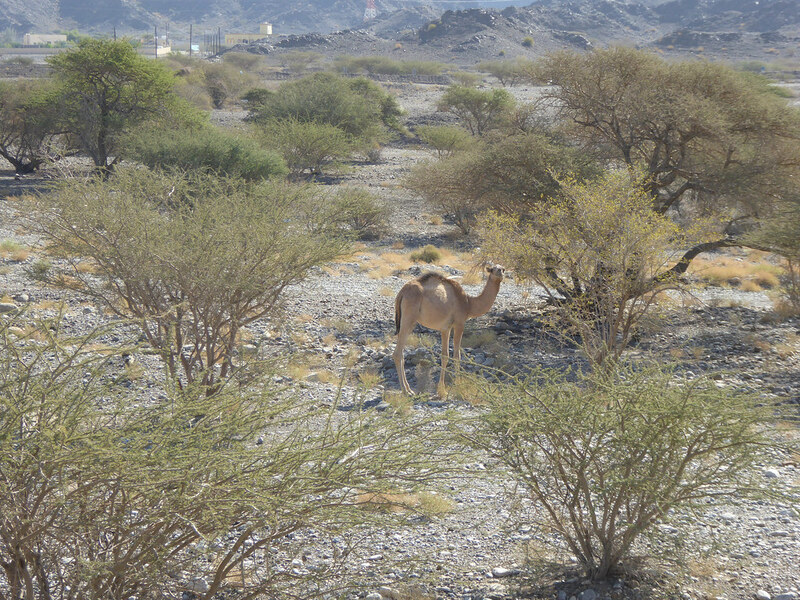 Luckily we were meeting our friend just on the fringes of Muscat, so didn’t have to face a long ride in the traffic heavy city. Our second meeting with Hamed was like meeting up with an old friend, everyone was excited and happy to be together, and we didn’t waste much time getting things started. The plan was to get organized and pick up supplies for the desert crossing, so we grabbed a bite to eat and went to a massive Carrefour where Claire and I, excited at the prospect of having a car and not having to physically carry all our shopping from point A to B, bought drinks and snacks for a few days (you can never have enough chips [crisps] when you are crossing the desert)! Hamed thought we were crazy at this point, but hungry cyclists are never the best grocery shopping partners anyways they think with their stomaches not their heads. (: Next stop was to pick up the Jeep we would be crossing in, so we drove over to a friend’s place to pick up the car. 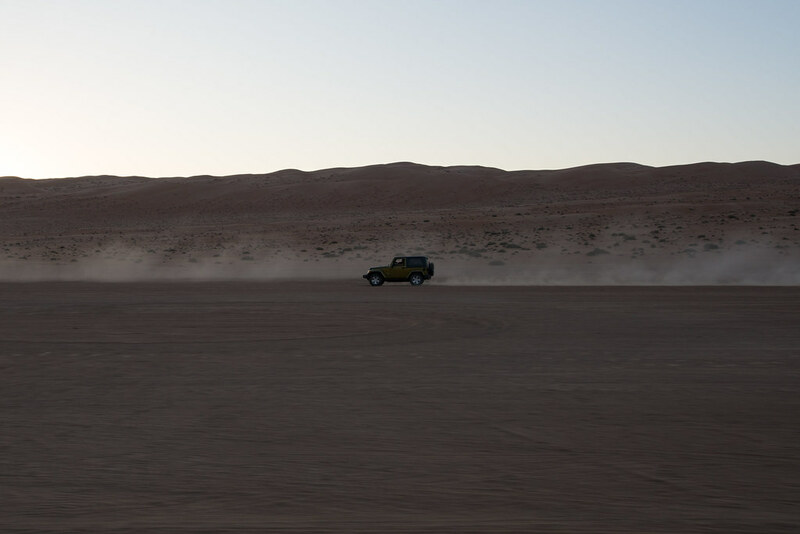 However, unbeknownst to me we would be driving both cars back to Hamed’s place. 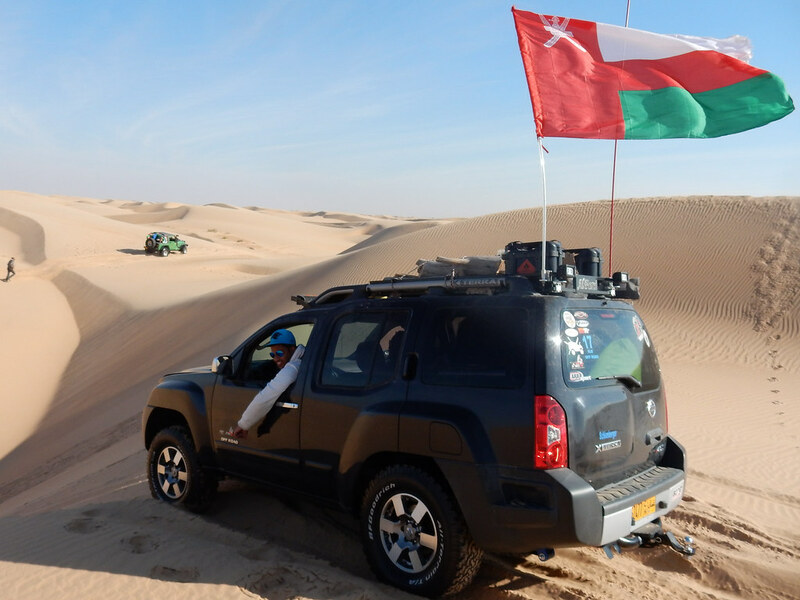 So, without warning I was driving a Jeep on the streets of Oman, it had been a few months since I was behind the wheel of a car, lucky for me Oman was probably one of the few countries we have passed through since Western Europe where the standard of driving is high. 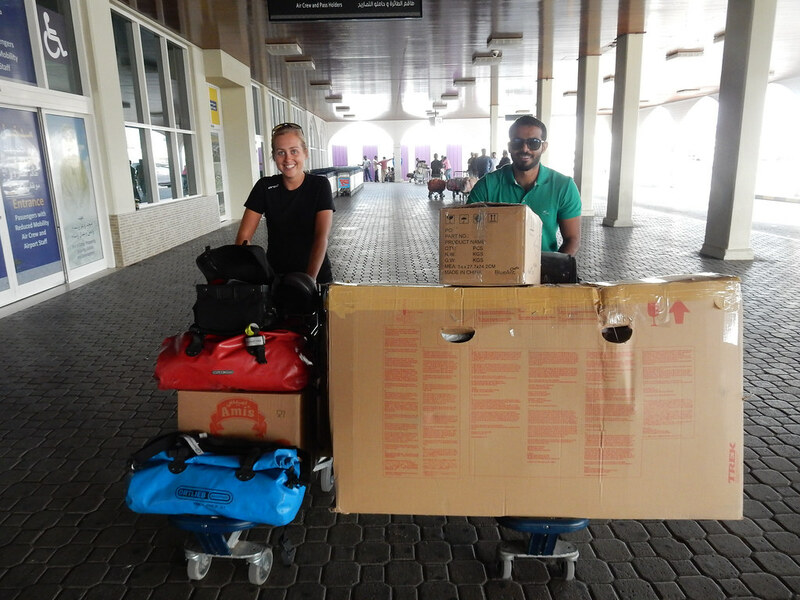 We arrived safely home and prepared for our departure the next day. Before we set off we managed to fit a few things in, we went to the Gulf Air office to plead with them to allow us some additional luggage allowance for our impending flight from Oman to India, amazingly they were really receptive and helpful when they heard about our trip, so big thanks to the Muscat office of Gulf Air! Then we met a friend of Hamed’s for lunch, who is studying engineering in Germany, was very friendly and who we would end up meeting again later in our trip. 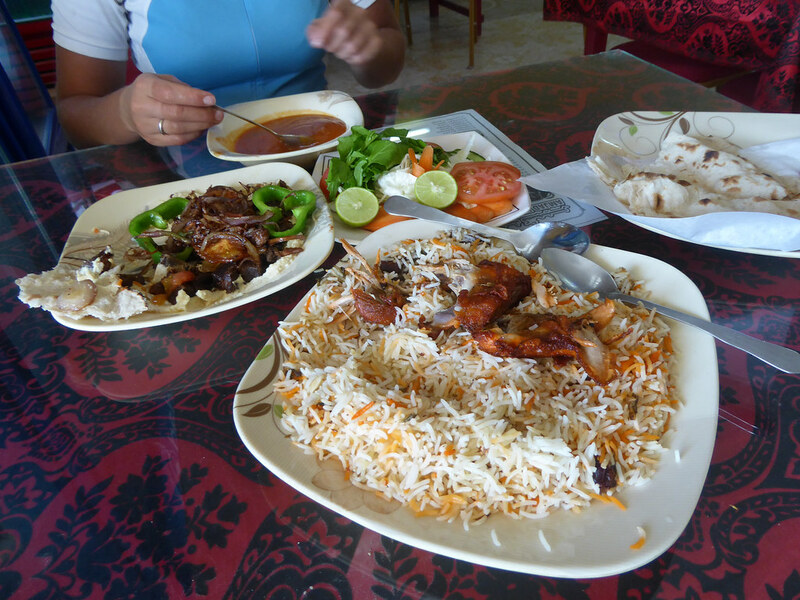 Food in Oman is nearly exclusively imported, both in terms of products but also cuisine. Because of this you tend to have numerous Indian, Pakistani, Turkish and Tanzanian restaurants and food. 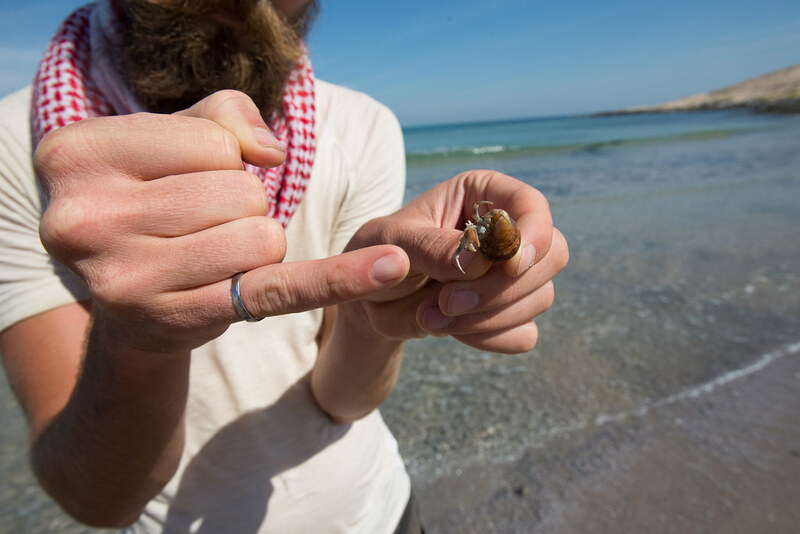 The way you eat in Oman is also interesting in a few ways, the first and most obvious one to a westerner is that you eat with your hand. Right hand only. Touching other people’s food with your hand is also okay, unless it is a formal affair. I even saw some mixing up of rice with some sauce by one friend for another. Food is served on one large plate, and more often than not that food was, was rice and meat. Where you eat is also a little bit different. Nearly every restaurant we went to had small private rooms where you sat, on the floor with rugs and cushions. One room even had a TV! Our friend brought us to one particular place where he confessed to us that he and his friends used to close the door, eat lunch and then the group would have a nap together in the restaurant! 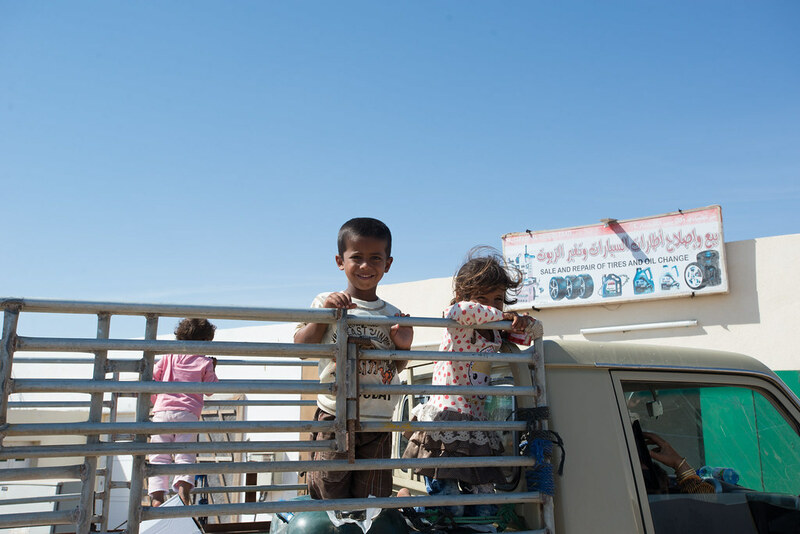 With our Jeep Wrangler filled with fuel and snacks we met half the group at a gas station. You could tell everyone was excited, and there was no shortage of banter among the guys from the moment we arrived. It was all guys, Claire was the only gal on the trip, which was strange for her, but was never an issue during the trip. You could spot the veterans of the group, just from their vehicles. 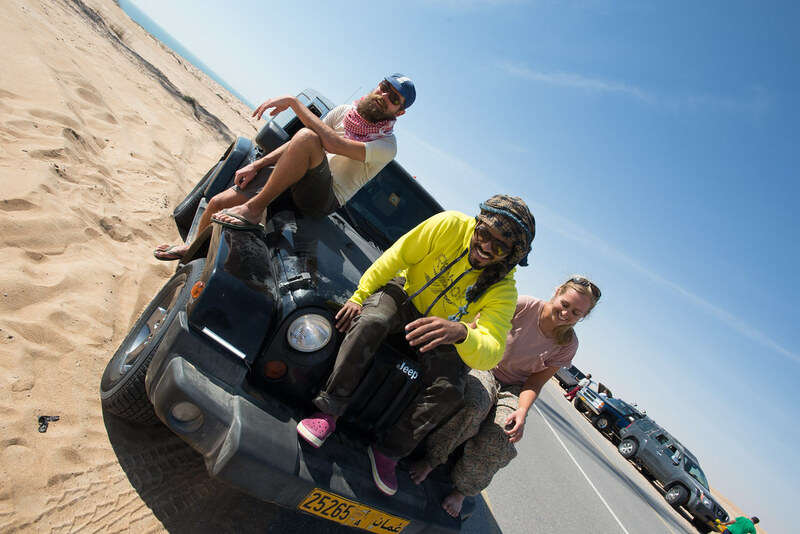 Some of the guys have done the crossing numerous times, one guy, Ali, is in the desert every few weeks or so. 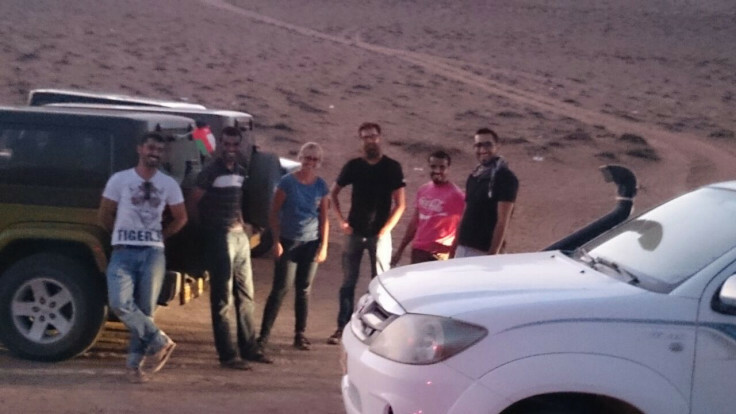 However, there was a real mix of a abilities and no shortage of first timers which included Hamed and us. Everyone, apart from Claire and I, were past or present work colleagues for an American gas and oil service company called Schlumberger. 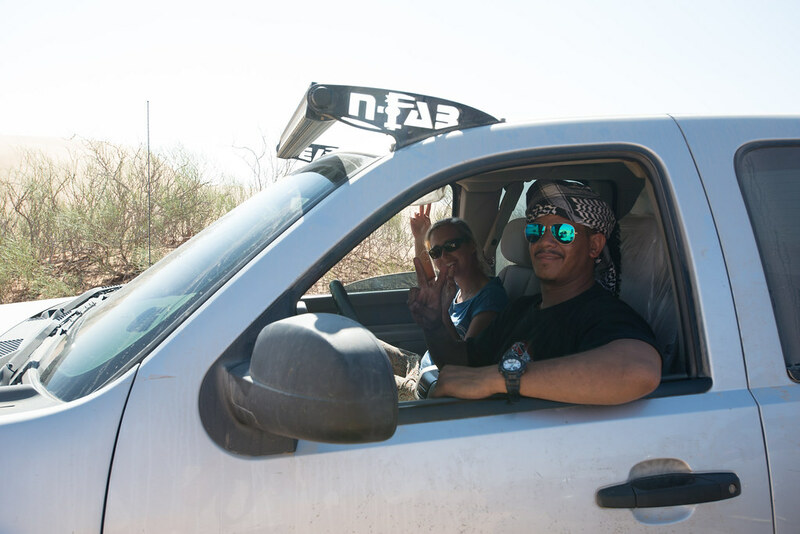 Mostly they work in the field, so in the blazing hot desert at pump locations, for 2, 3 or 4 weeks on followed by the same amount of time off. Talking to many of the guys it sounded like tough work that during the summer saw them regularly working in 50-60 C heat. Intense. 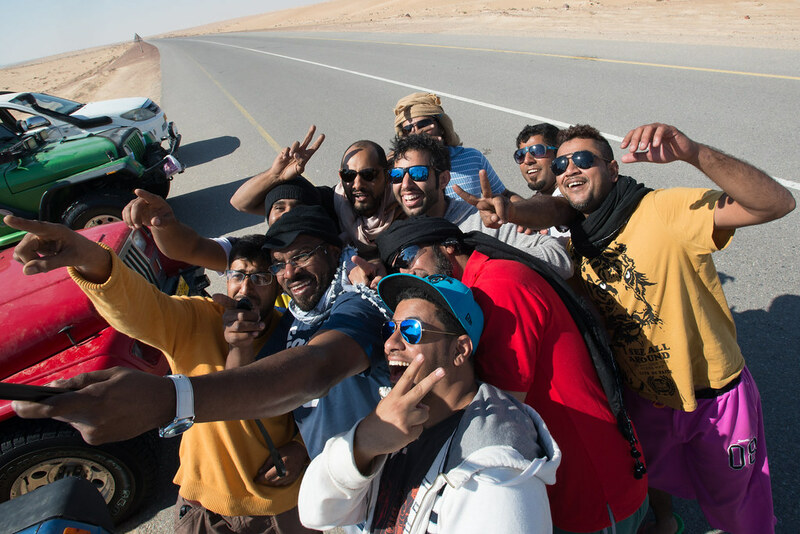 We headed towards the desert and met the other half of the group at a gas station at the entrance to the dunes. We re-fueled, bought a spare tank for extra gas, some more water and deflated our tires down to 20 psi. in preparation for the sand. 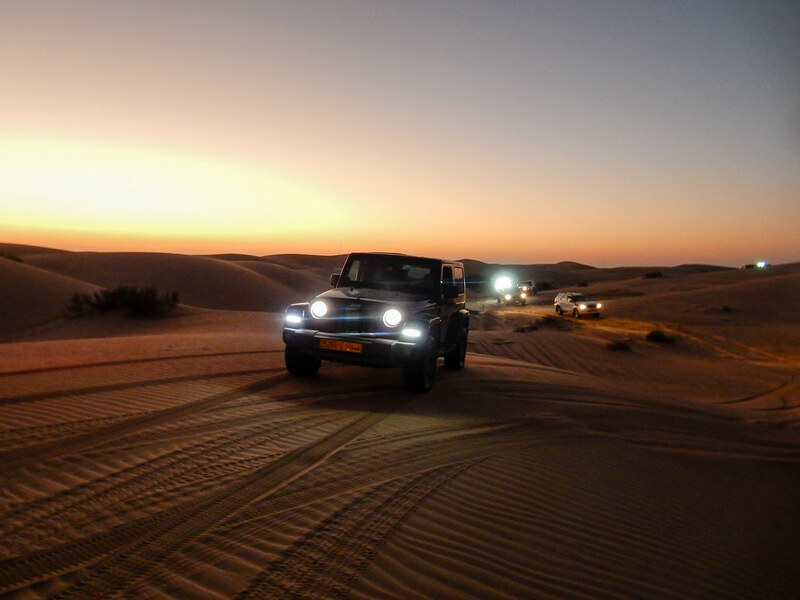 With all heads accounted for, just shy of 40, each car got a number, 17 in total, we headed out into the sand. 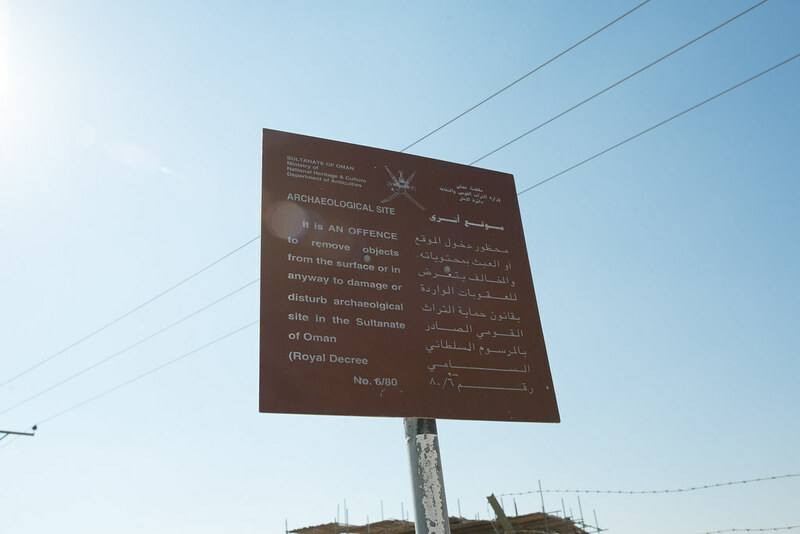 The desert we were about to cross was called Wahiba Sands named for the nomadic tribe of Beduin who live in the area. 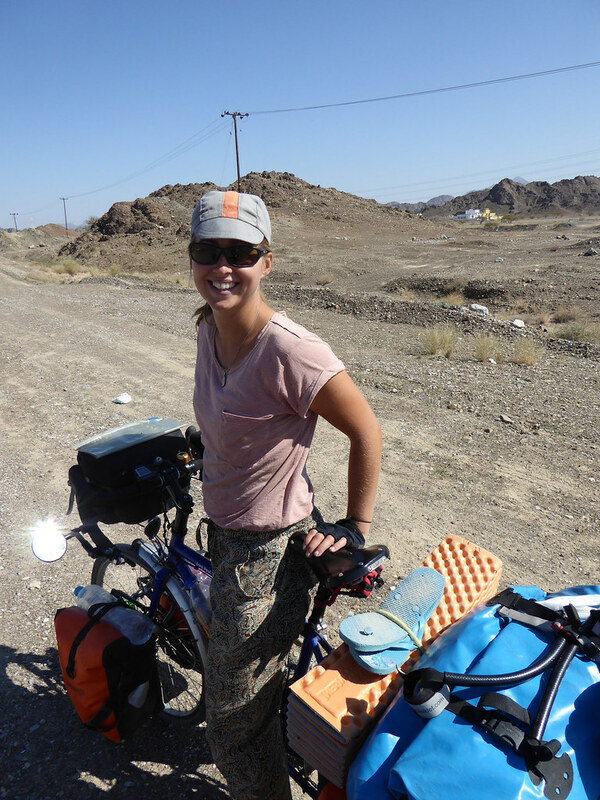 The plan was to cross about 150km of desert over 2 days. However, the distance was far from distributed evenly over the days. 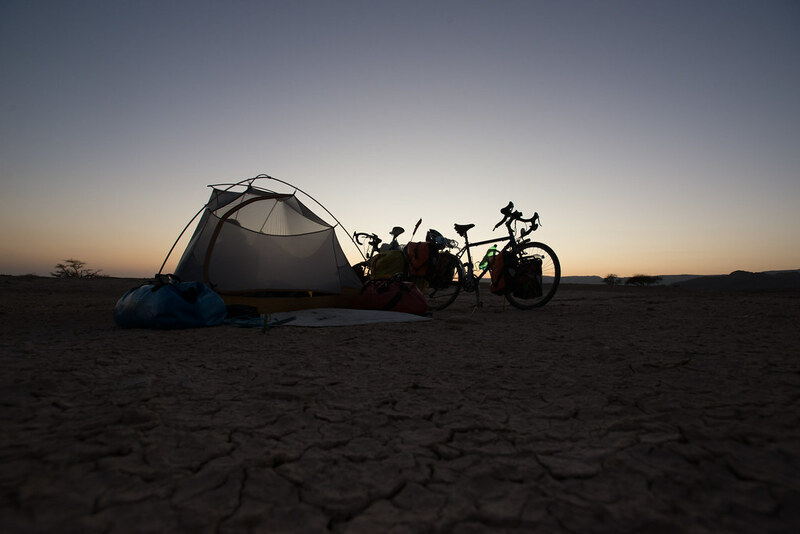 When we arrived we b-lined it into the heart of the Whaiba covering around 125km at dusk in the dwindling hours of light and into the night. The ‘road’ was mostly flat and straight and was regularly used by locals and adventure seekers, so we were often moving with some speed. Now those of you doing the math at home, that would leave one day to cover 25 km, and it would sound like not so much but we would soon learn that 25 kms in the desert is a lot. 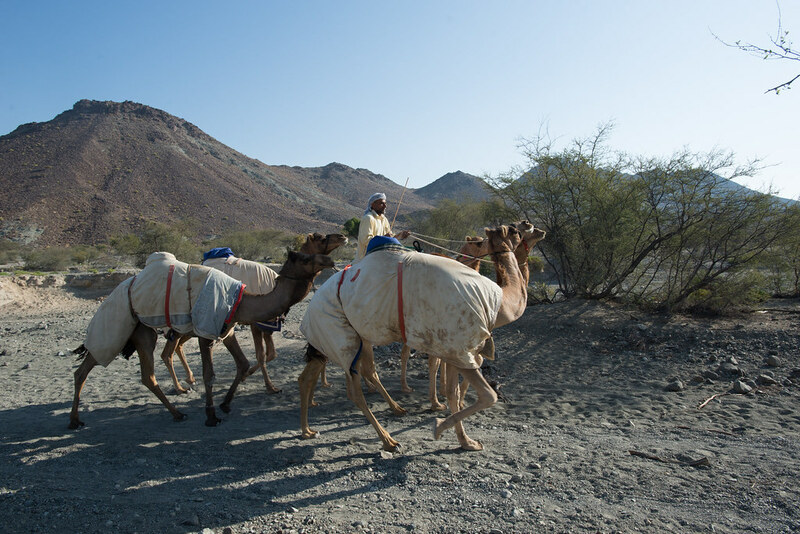 The Beduin are a nomadic people who live in the harsh Desert environment of Oman, which doesn’t always mean the sand. 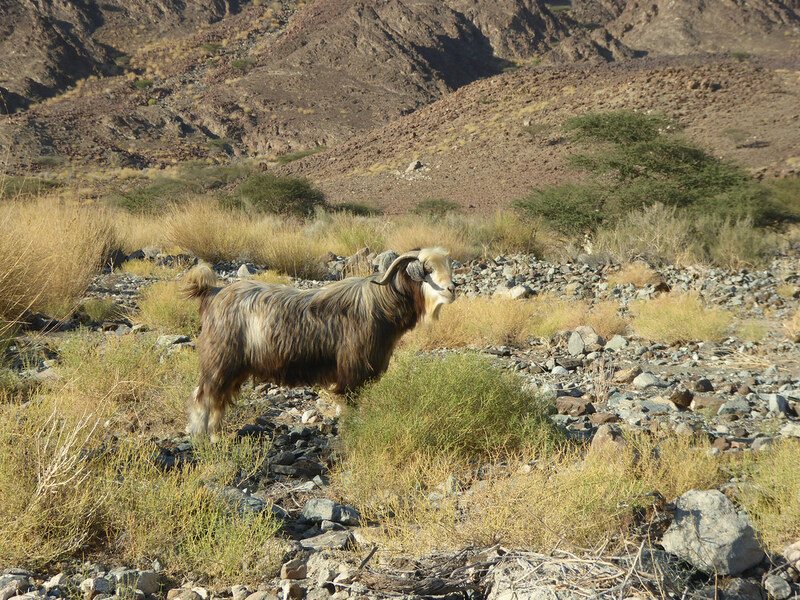 The Beduin seemed to keep to themselves and the Omani’s which we met clearly differentiated themselves from the Beduin. However, whenever the two groups met the Beduin were always very friendly and would always invite us all to their home. The homes, or ‘camps’ which we saw were often isolated and very basic, and if you were to use these camps as a barometer for measuring the wealth of the Beduin you would in many cases be way off point. 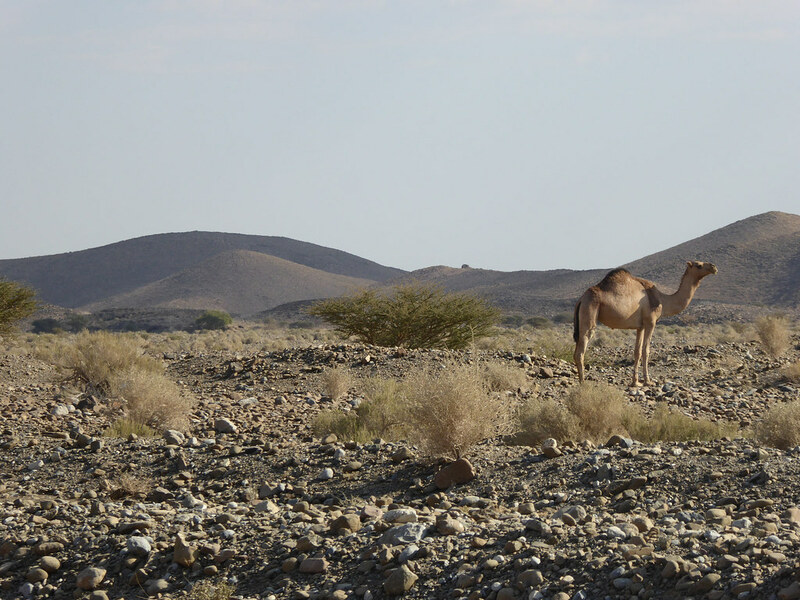 Some of the desert Beduin sell camels, and some of the camel traders specialize in racing camels, and some racing camels are expensive. Really expensive. Thoroughbred horses can be worth up to $64 million dollars, it turns out a good racing camel can go for upwards of 5 million dollars. 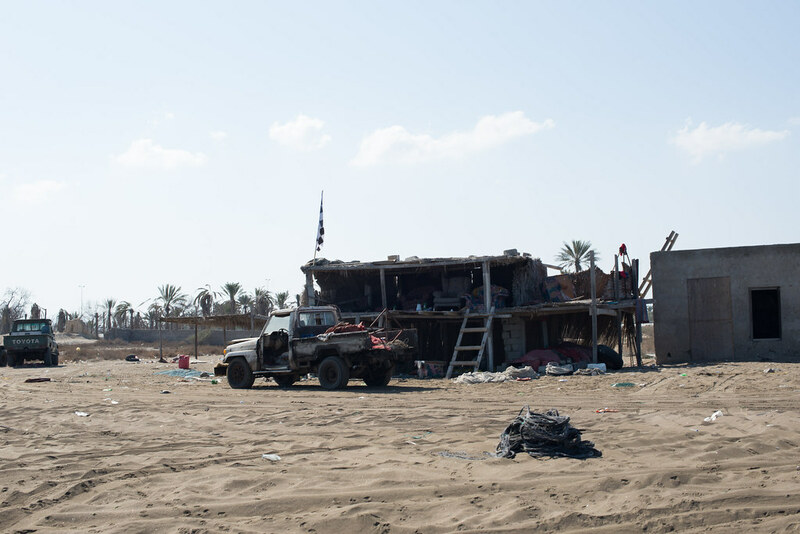 So, apparently it isn’t rare to see a brand new Land Rover parked in the middle of nowhere next to a shanty shack in the desert. Oh, and those camels, they are raced by robots not jockeys. Robots! Turns out the reason for this is that children used to race the camels back in the day… not so politically correct these days, so naturally the next best thing…. robots? The world is a crazy place. Another interesting thing was that every Beduin seemed to have the same car, same model, colour, and even graphics on the side of the car. Toyota Land Cruiser, sandy brown, with jazzy red graphics on the side. Not a bad choice, but I wonder if they got a group discount, or maybe they just don’t know that you can get cars in different colours? 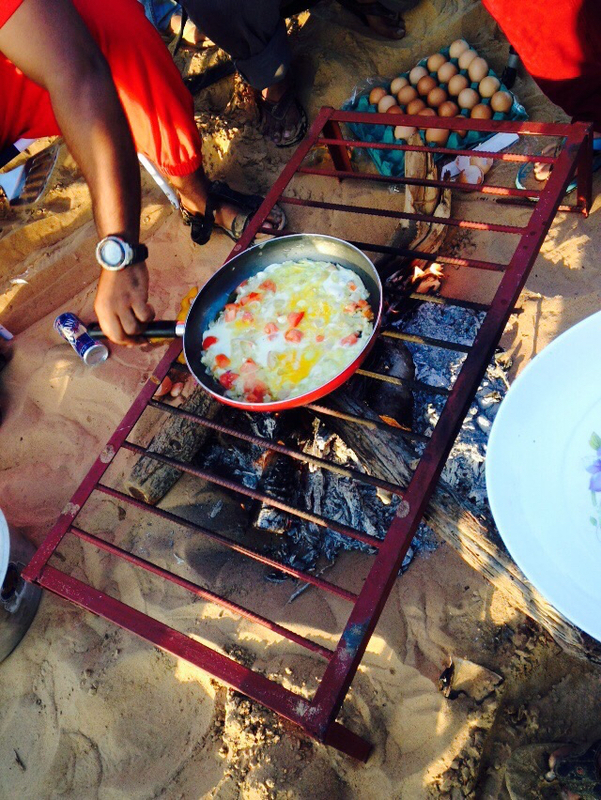 The next morning the group was up and cooking breakfast early, which was a bizarre mix of american-influenced food including : eggs, hot dogs, white bread rolls, squeezable processed cheese, and potato chips. We packed up and the real desert crossing began. Like ants marching one by one, we set out with the leader of the group Ali trailblazing into the virgin sands of the dunes. 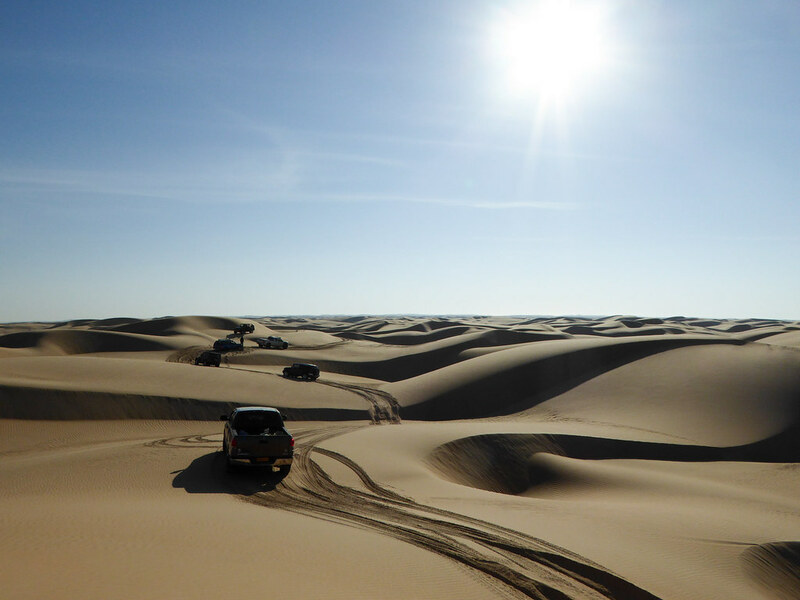 There is no set path, and no way of knowing what is behind the sand dune you are about to go over, so the route is anything but straight. 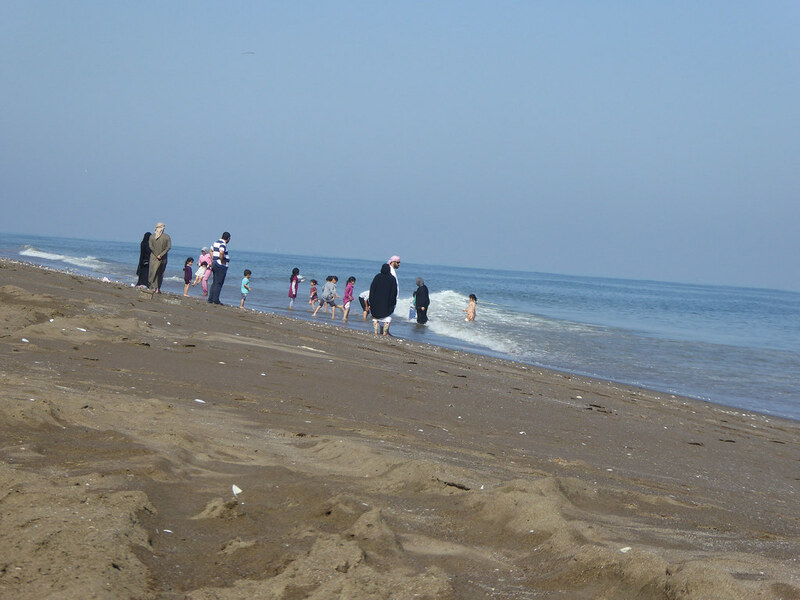 The sand is also quite soft generally, and extremely soft in some areas. 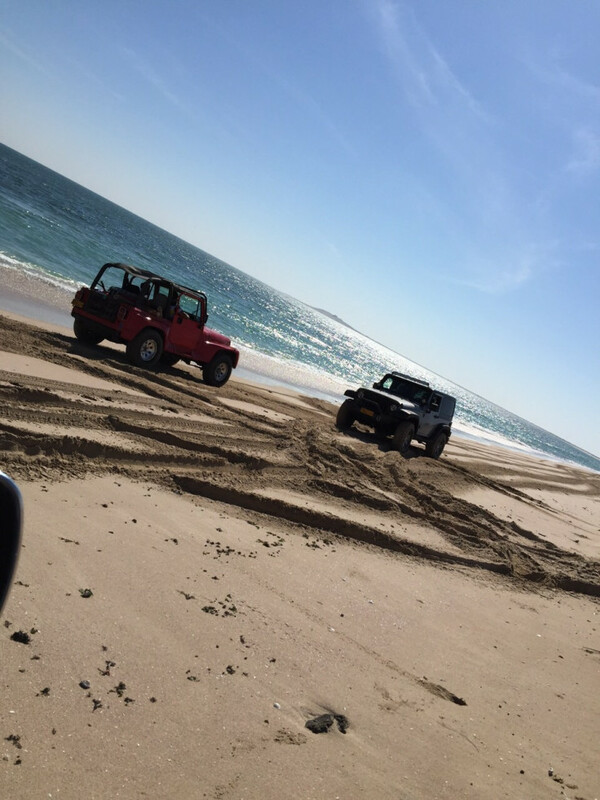 Navigating the sand seemed challenging but in some ways like driving in snow. 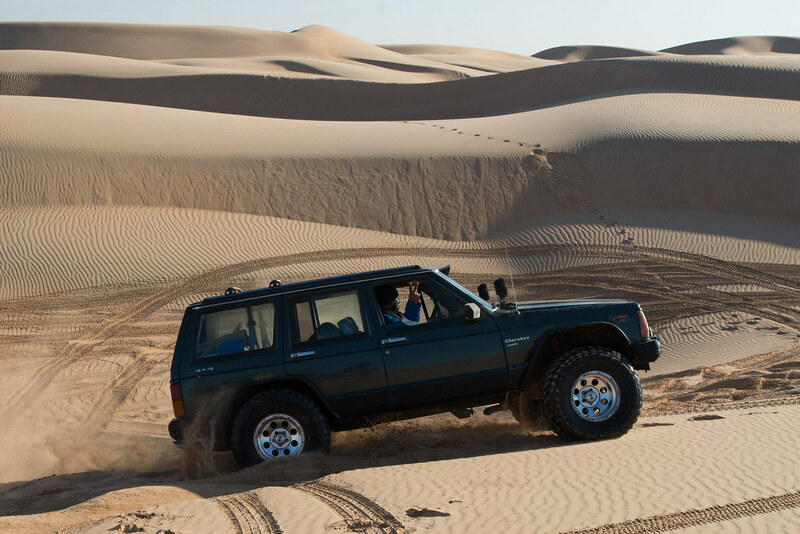 The vehicle was less responsive to steering, you need to keep your momentum in the soft sand or you will never get going again, and once you are stuck, you are really stuck and cars got stuck regularly. The veterans of the group would swoop in to tow them out immediately. 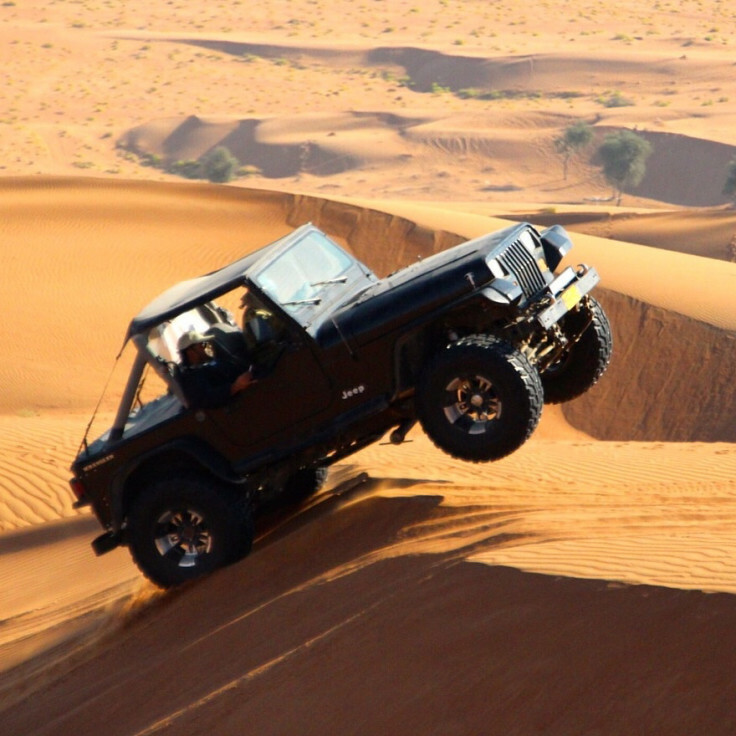 If you have ever gone 4x4ing before you know that going up, or down steep inclines is a bit of a rush. When you are going over a something steep it feels like you are driving towards a wall, at speed, before you get shot up and start to fly over the obstacle. 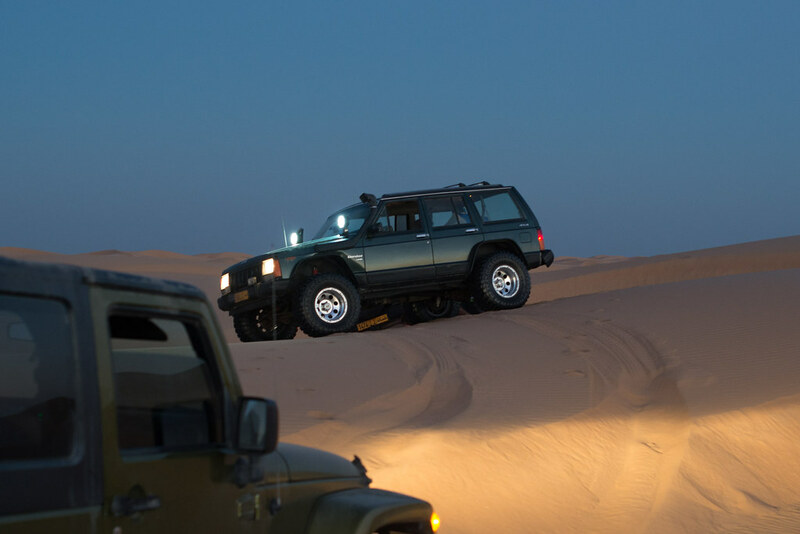 While descending, feel like you are rocketing towards the ground, while you yourself are being lifted out of your seat towards the windshield there is part of you that wonders what is keeping the rear wheels from bucking over your head. It’s great fun. 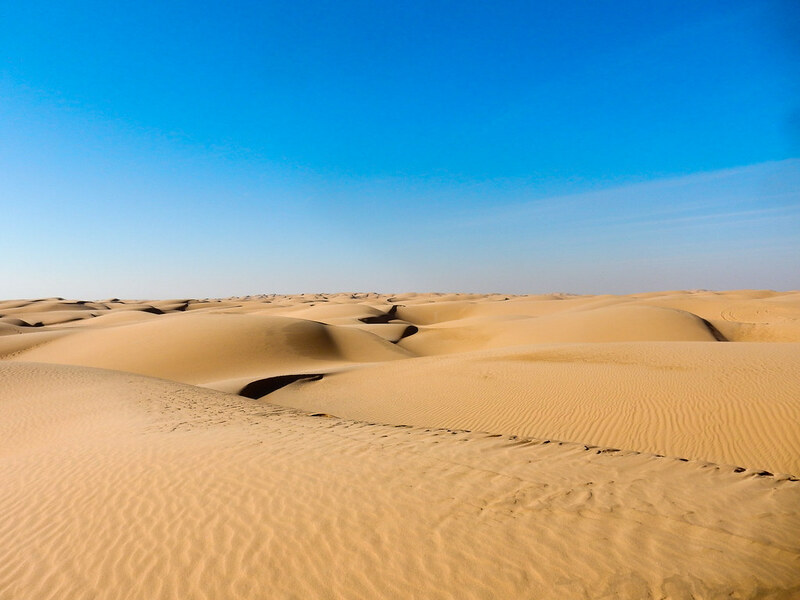 I have been in a desert a few times before, however, I have not been in a sand desert with dunes as far as the eye could see. 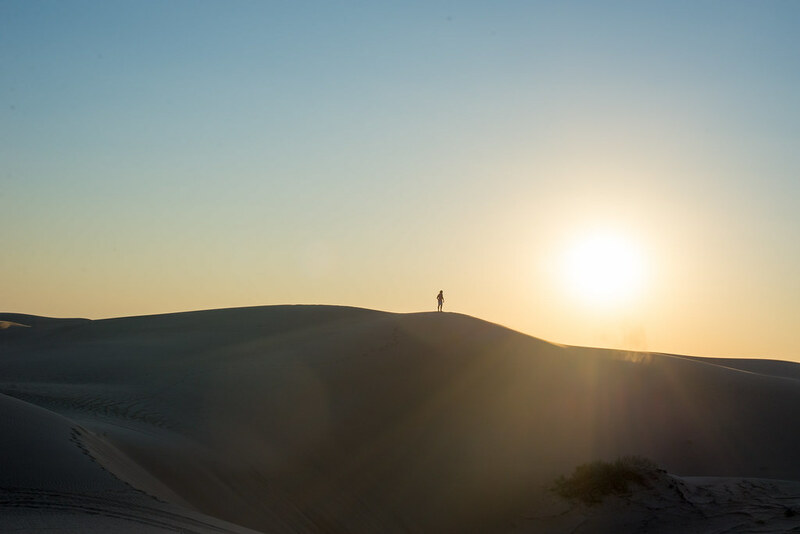 It was a really beautiful place; the shapes, the colour, and the tranquility of the dunes was unlike anything I had experienced before. It is a truly special place, wild, raw and unforgiving. 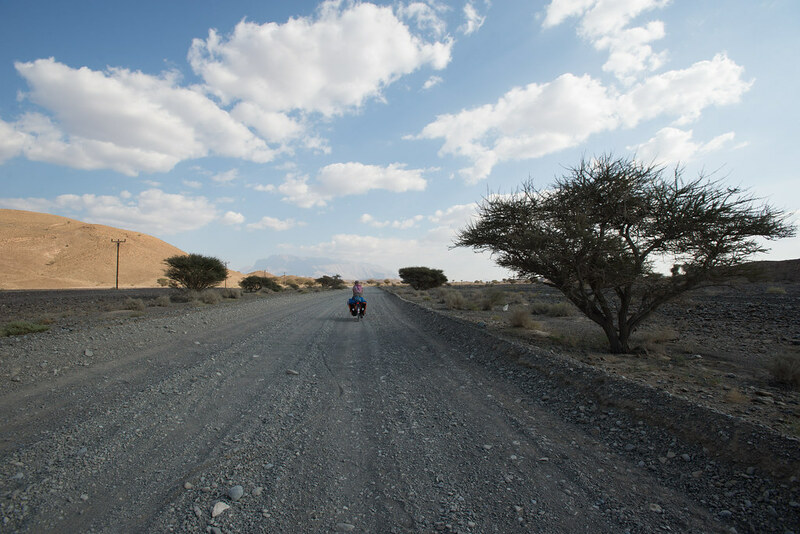 Not somewhere you can really get to on a bicycle, so we felt fortunate that we were able to experience it while in Oman. I think we both would have been happy to spend another night or two in the sand. 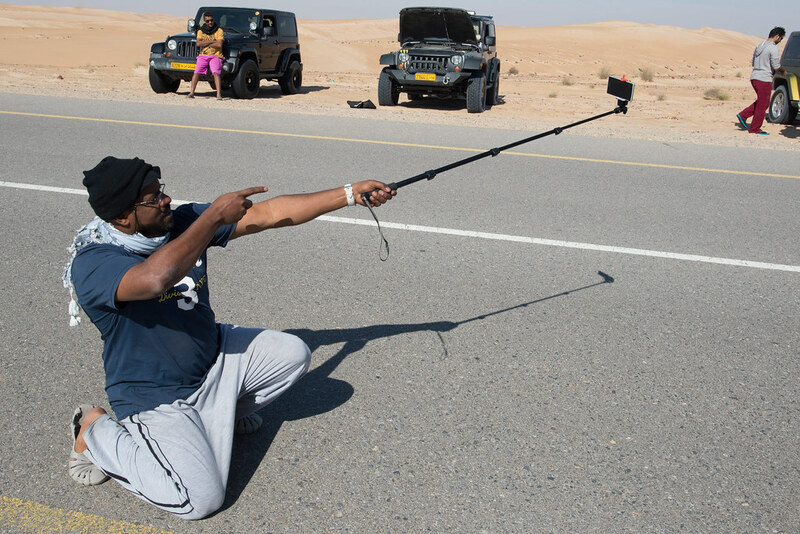 The desert claimed it’s fair share of victims, with numerous cars getting beached or stuck in the sand, a drive shaft breaking on a jeep twice, a radiator breaking and a few tires being knocked off their rims. Every problem was solvable by the group, many of the guys were well prepared and ready for nearly any mechanical problem. Beached cars was part of the fun, and being towed and towing cars was a point of shame and pride respectively. 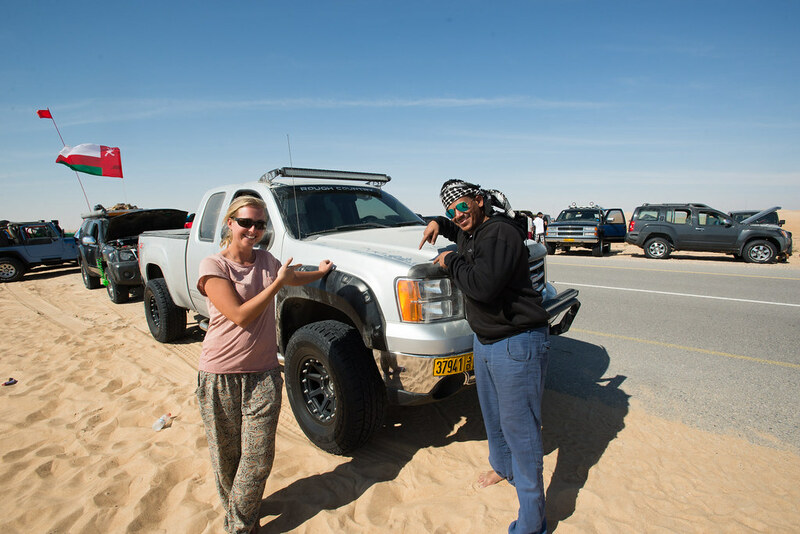 One character on the trip Arif, who was driving the biggest truck on the expedition was dubbed Big Daddy because he was always pulling everyone from the sand. Progress was slow, very slow, and with all the mechanical problems and cars getting stuck we managed to do 13 km by the time it got dark. 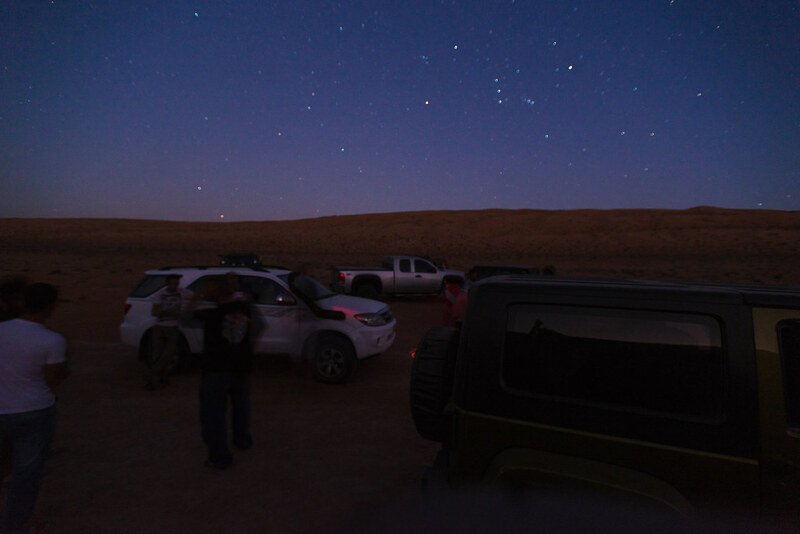 With some of the group in need of getting back that night for work or other obligations we kept on driving into the night. 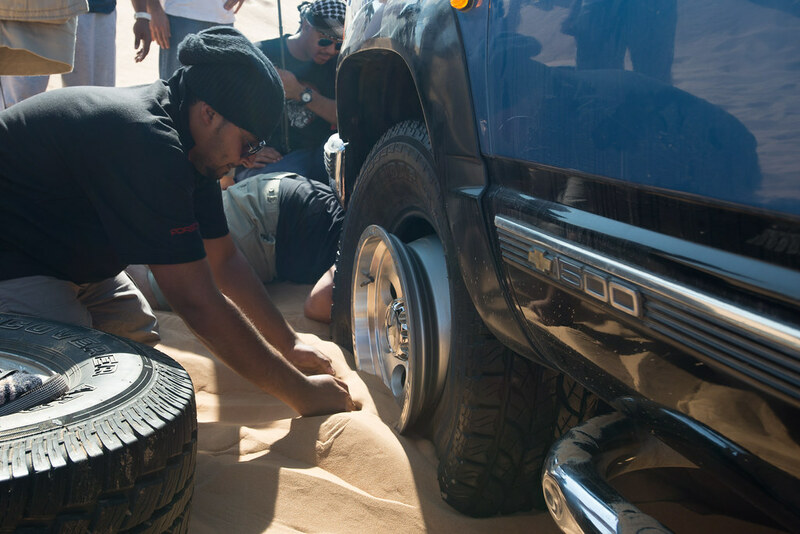 This proved to be a bad idea, with the route becoming more challenging, fatigue of the drivers, and some unlucky sand patches, cars were getting stuck more frequently and by midnight we had covered another 3km. 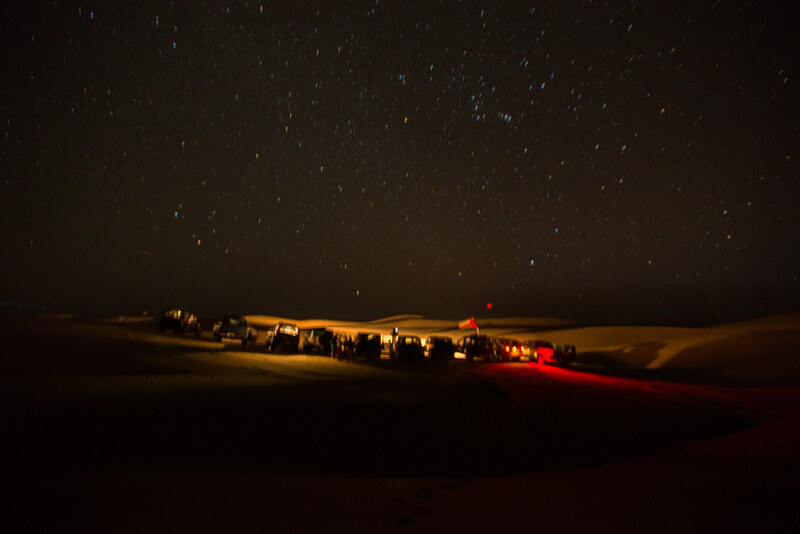 We set an impromptu camp under the stars with some drivers sleeping in their seats ready to get going the next day (one guys brother was getting married the next day). 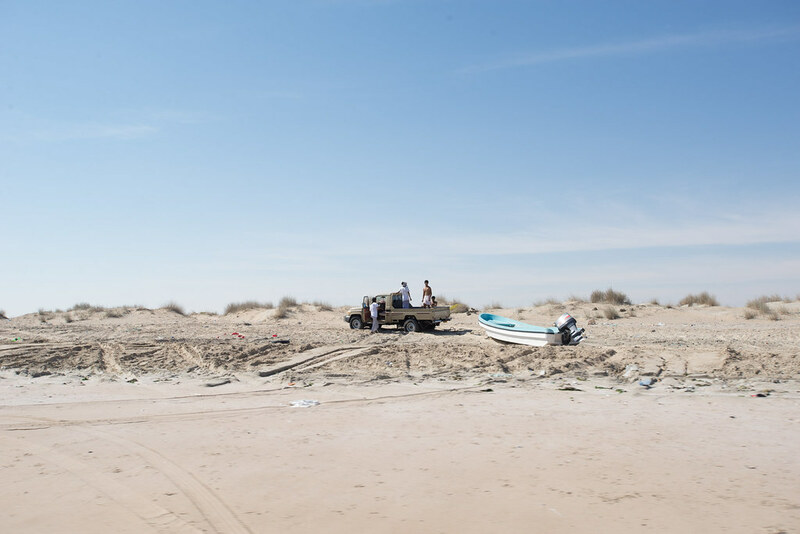 Day three of the crossing was fast, we got through some technically challenging areas and before we knew it we were out of the dunes and into scrubland from which you could see the sea and the highway! 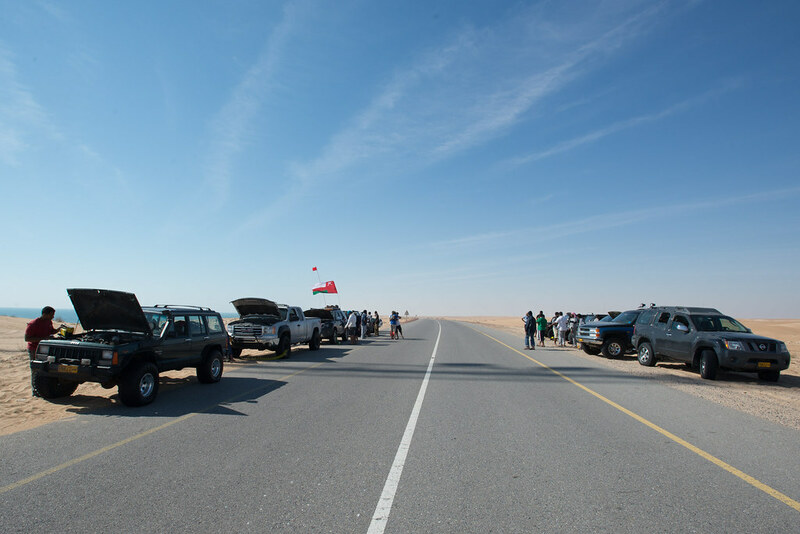 With all the cars successfully out of the desert we gathered on the highway, took some photos, said our farewells and thanked the group for the adventure. It was an amazing experience and certainly a highlight of our trip so far. Back on hard ground we put the pedal down and part of the group headed to the beach for a swim and a final meal and some unwinding after the crossing. 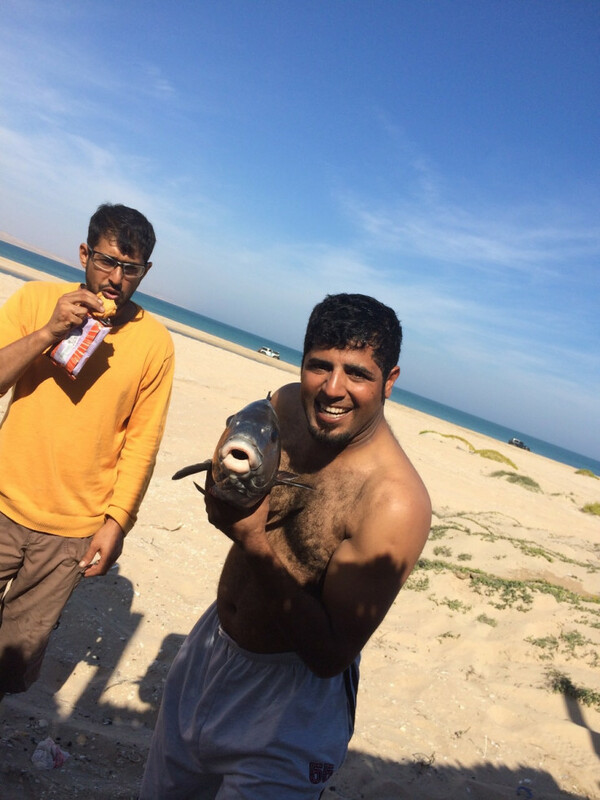 Hamed had packed his spearfishing gear and took to the water. Claire and I joined in with some snorkelling gear and saw some really beautiful fish, reef creatures and sea turtles! 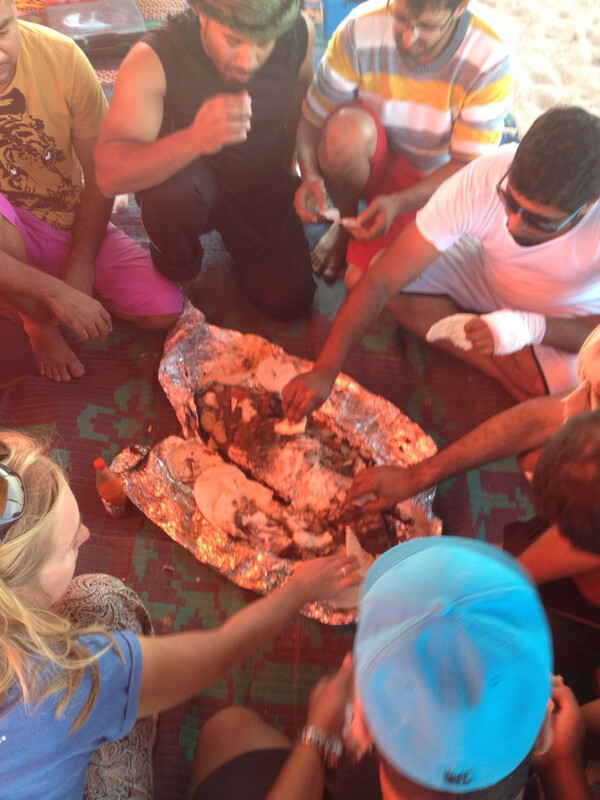 Meanwhile, Hamed had speared a two-foot beast of a fish and a couple smaller fish for the group to feast on. After a few hours on the beach we said or final farewells to the group and headed off to continue our adventure. 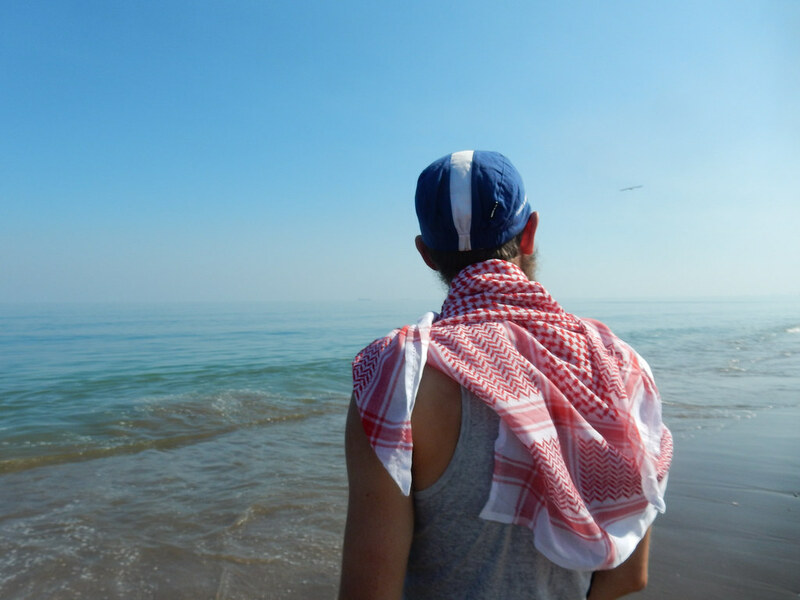 The next few days were spent hanging out with Hamed seeing the east coast of Oman, including the famous Wadi Shab (where we went cliff jumping), the coastal city of Sur and Rustaq a beautiful and authentic Omani town complete with an old Portuguese fort. 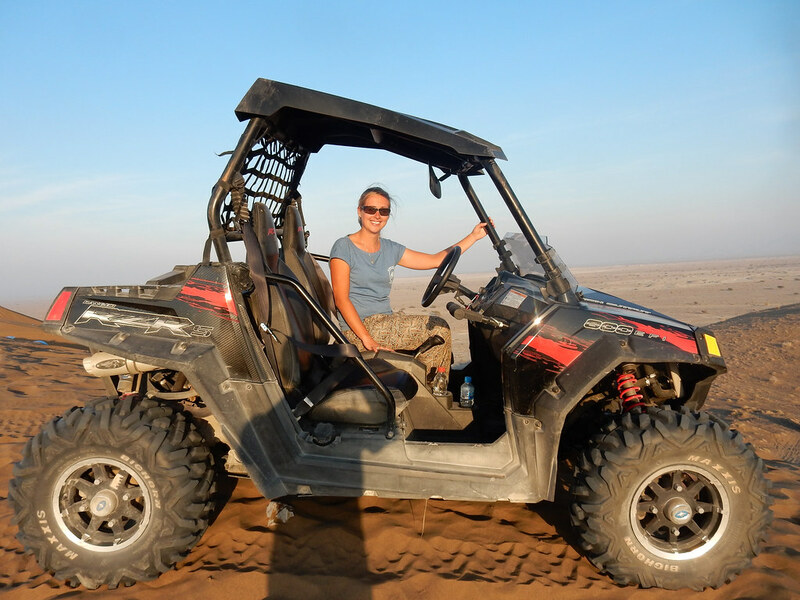 We also went to some high dunes with a group of philanthropist adventurers, the Oman Discovery team, to play around on quad bikes in the sand. 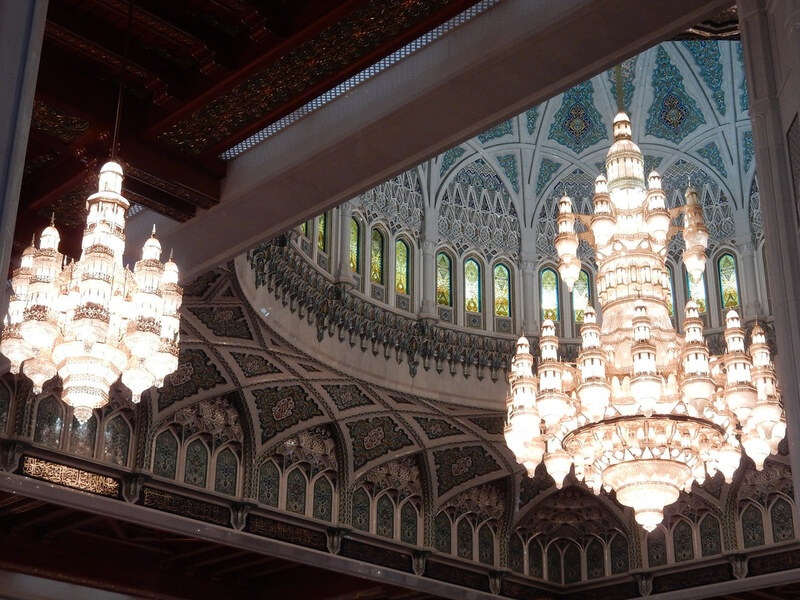 We also met a ton of Hamed’s friends and colleagues in and around Muscat, went to the main Souq in the city centre and visited the Grand Mosque which was spectacular. 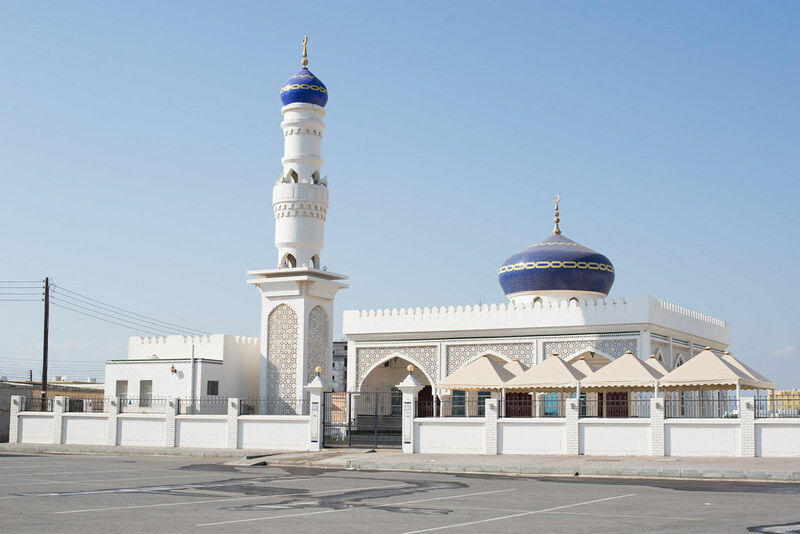 It is also the only Mosque which foreigners are allowed to visit in Oman, and it used to tout the worlds largest hand woven carpet, which has since been outdone by a new mosque in the Middle East. 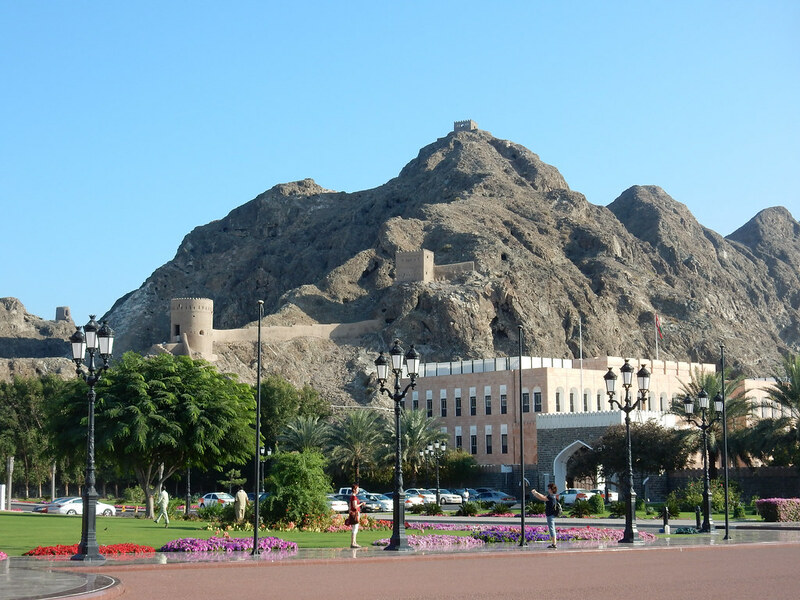 We got to see a fair amount of Muscat but know there was so much more to see from the sea to the mountains it was a interesting and scenic place. 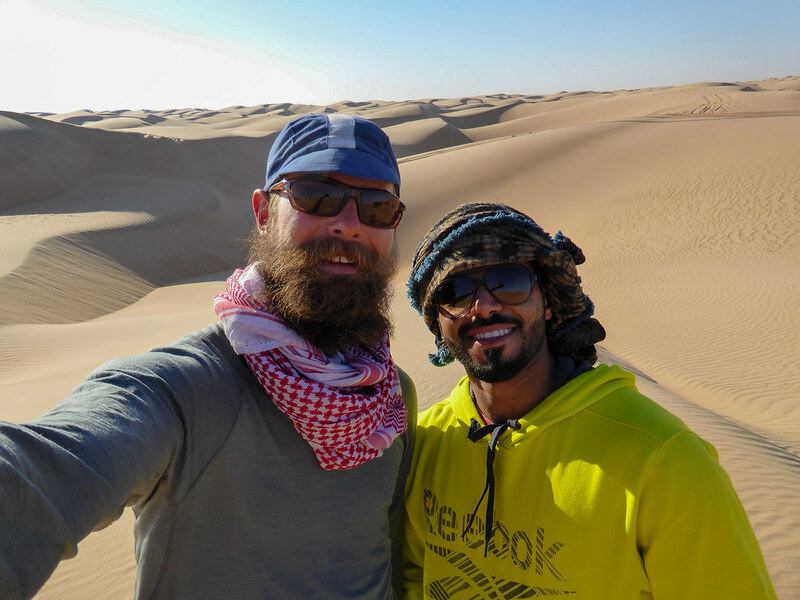 We felt really fortunate to have met Hamed not only because he helped to make our time in Oman really special, but also because we made a new friend one that we felt we had known for years. 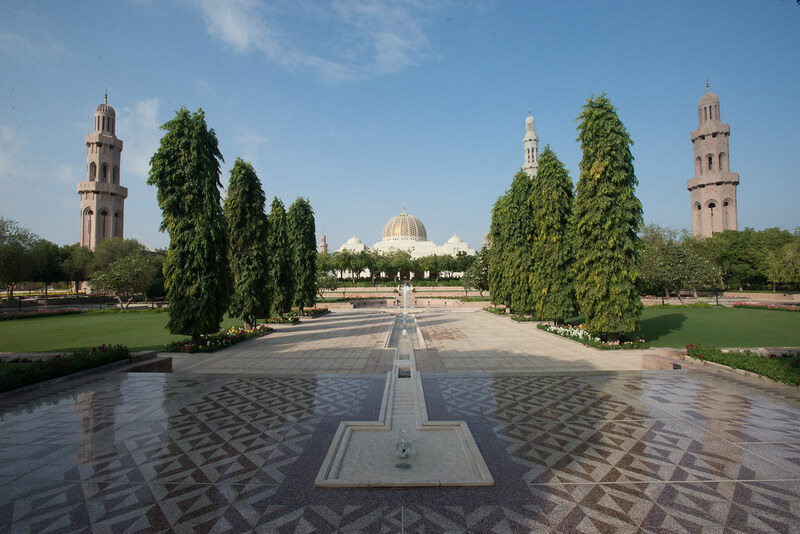 We weren’t sure what to expect from Oman but our experience far surpassed our expectations. 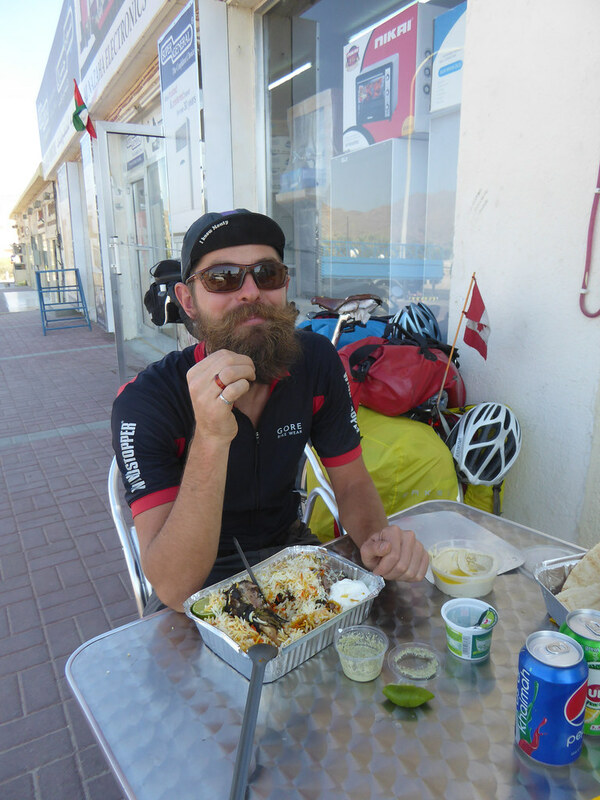 Oman was an amazing place to cycle for a lot of reasons. 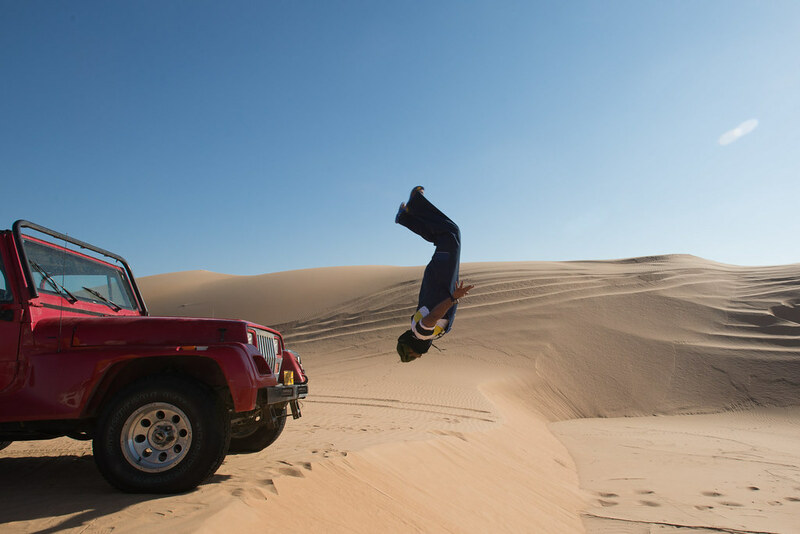 Omanis are great drivers and for the most part curious and cautious. The roads in the country are in very good condition nearly everywhere. Camping was a breeze in every part of the country we travelled to. 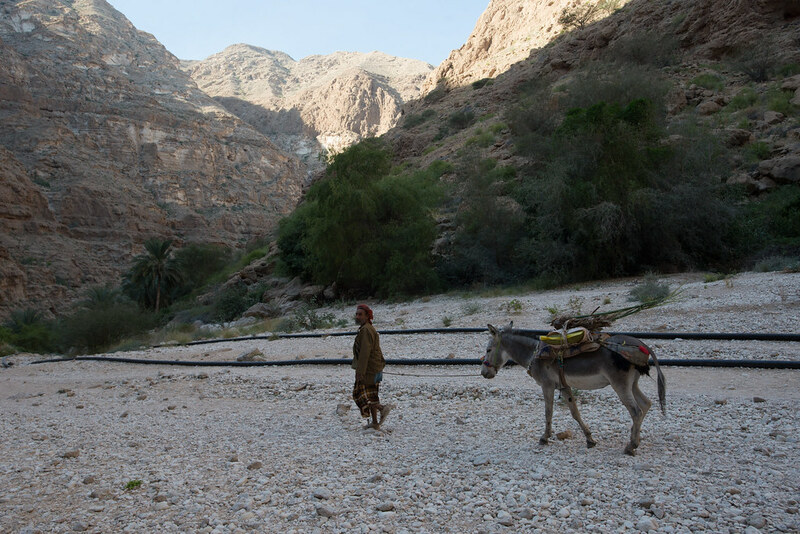 It was easy to get fresh, clean, and free water, even in fairly remote areas. 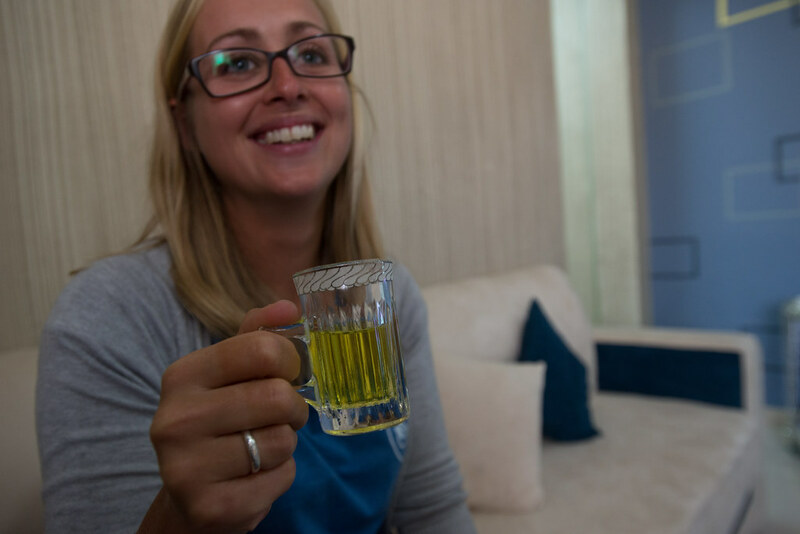 The Omani people are friendly and kind, and we were invited for Omani coffee nearly every other day. The climate and weather were amazing. 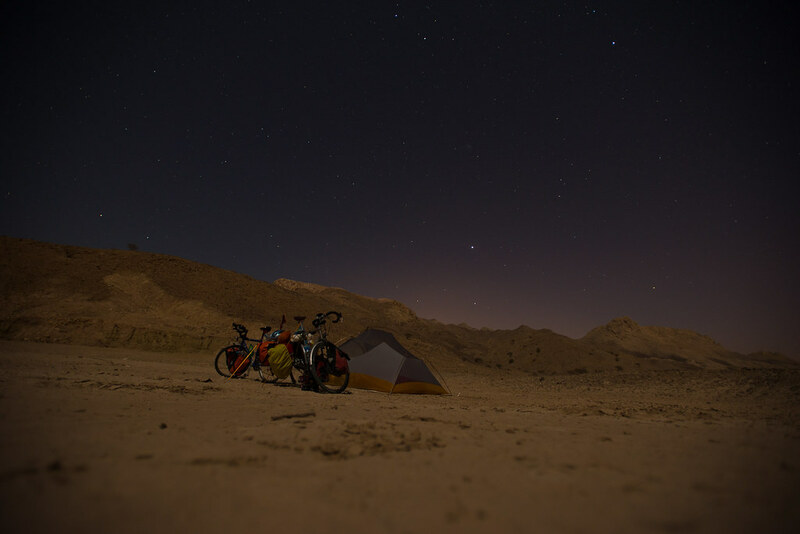 Clear cloudless skies were everything you could hope for and more, especially at night the skies were clear. No bugs! Since water isn’t really standing anywhere, there were no mosquitos except for by rivers, and there aren’t really any creatures that will bother you while wild camping. 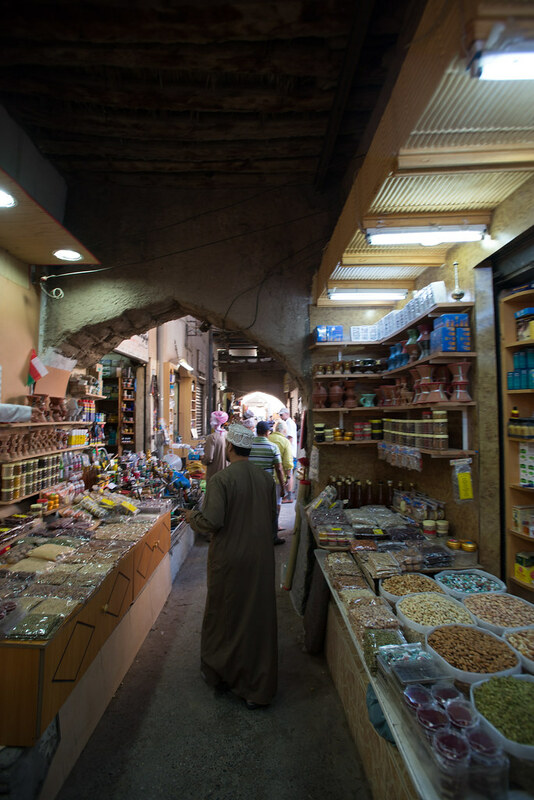 Dates: Eat as many as you can while you are here (or in the Gulf), the best we have ever had! 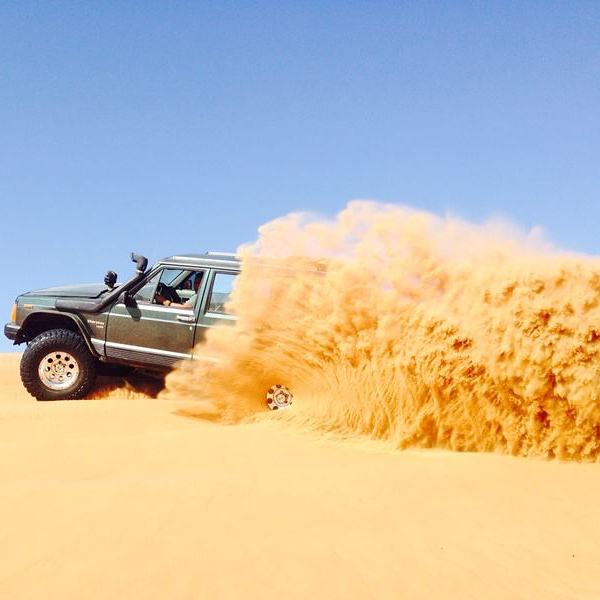 Amazing plot, it was great having you in the off road trip. I’m glad you guys enjoyed it and wish you best of luck in your upcoming adventures. I’ll keep following your blog to read more about the progress of your trip. I am so happy that your un-expected “detour” turned out so amazing! 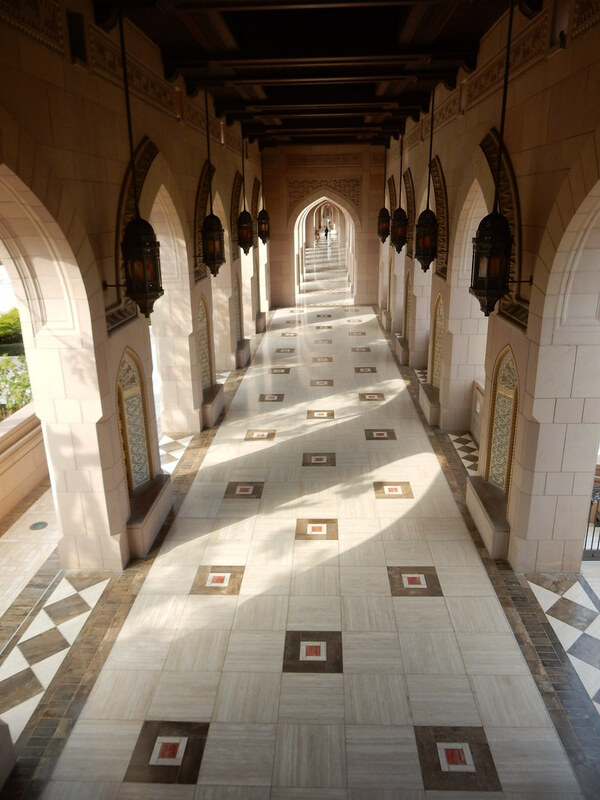 Sounds like you had an incredible time and I learned a lot about Oman just reading your post!